Whole-organism chemical screening can circumvent bottlenecks that impede drug discovery. However, in vivo screens have not attained throughput capacities possible with in vitro assays. We therefore developed a method enabling in vivo high-throughput screening (HTS) in zebrafish, termed automated reporter quantification in vivo (ARQiv). In this study, ARQiv was combined with robotics to fully actualize whole-organism HTS (ARQiv-HTS). 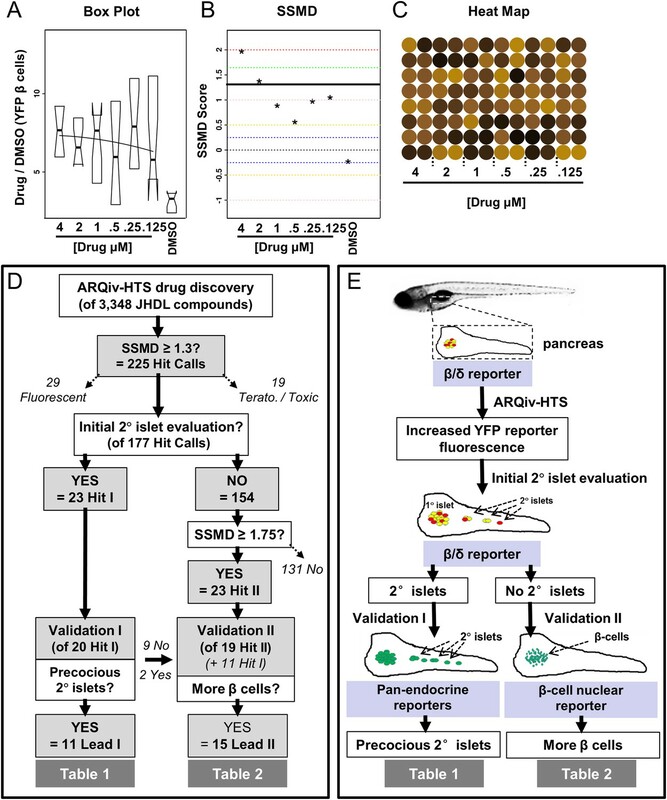 In a primary screen, this platform quantified cell-specific fluorescent reporters in >500,000 transgenic zebrafish larvae to identify FDA-approved (Federal Drug Administration) drugs that increased the number of insulin-producing β cells in the pancreas. 24 drugs were confirmed as inducers of endocrine differentiation and/or stimulators of β-cell proliferation. Further, we discovered novel roles for NF-κB signaling in regulating endocrine differentiation and for serotonergic signaling in selectively stimulating β-cell proliferation. These studies demonstrate the power of ARQiv-HTS for drug discovery and provide unique insights into signaling pathways controlling β-cell mass, potential therapeutic targets for treating diabetes. Type 1 diabetes is caused by the body incorrectly destroying the cells in the pancreas—known as β cells—that produce insulin and so control the amount of sugar found in the bloodstream. Drugs that increase the rate at which new β cells form could therefore help to treat this disease. High-throughput screening is a technique that uses automated systems to rapidly test the effects of large numbers of drug-like compounds on living cells. Unfortunately, drugs sometimes produce different effects in animals than those they produce in isolated cells or other more simplified screening systems. Zebrafish are often used in biological studies because the larvae are transparent, making it easier to study what goes on inside them. Wang et al. have now developed a high-throughput screening system that uses genetically engineered zebrafish. The zebrafish contain ‘reporter’ genes that fluoresce when a gene is activated, and the intensity of the fluorescence can be interpreted to work out the effects of an applied drug. To search for compounds that cause β cells to grow, Wang et al. created two reporter genes: one that glows yellow when new β cells form, and one that glows red when other pancreatic cells are stimulated. An initial screen tested the effects of over 3000 drugs, most of which have been approved for use in humans. This screen identified and confirmed 24 drugs that trigger the growth of new β cells or other pancreatic cells in zebrafish larvae. Further investigation uncovered new roles for two signaling pathways that had not previously been linked to pancreatic growth. One pathway—the serotonin pathway, which is better known for transmitting signals in the brain—selectively stimulates the growth of new β cells. The work of Wang et al. therefore presents a number of possible drugs and pathways that could be targeted in the search for a new treatment for type 1 diabetes. Furthermore, this new whole-organism, high-throughput screening system could be used in the future to search for drugs that affect a range of other biological processes. Diabetes is associated with reductions in pancreatic β-cell mass, thus, curing diabetic patients will require β-cell replacement therapy. β cells can be replaced by transplantation of pancreatic islets (Vardanyan et al., 2010). Alternatively, drugs that induce β-cell differentiation in endogenous pancreatic progenitor cells (Chong et al., 2006a) or which stimulate β-cell proliferation (Lysy et al., 2013) would provide a significant step forward in the treatment of diabetes by avoiding surgical risks. Placing animal models at the start, rather than the end, of the drug discovery process has the potential to circumvent high attrition rates that have plagued in vitro high-throughput screening (HTS) over the past two decades. The zebrafish is an ideal vertebrate model system for whole-organism-based drug discovery (Zon and Peterson, 2005). As a key example, a chemical derivative of prostaglandin E2 (16,16 dimethyl prostaglandin E2), originally identified for the capacity to induce increased hematopoietic stem cell (HSC) numbers in zebrafish embryos, recently completed Phase I and entered Phase II clinical trials as a means of enhancing engraftment of cord blood transplants in leukemic patients (Cutler et al., 2013). Conserved cellular and molecular mechanisms are known to govern pancreatic development and β-cell proliferation in zebrafish and mammals (Zorn and Wells, 2007; Kinkel and Prince, 2009). We therefore hypothesized that identifying pre-existing drugs that promote increased β-cell mass during zebrafish development might provide potential new drug leads and therapeutic targets for treating diabetic patients. In embryonic zebrafish, early endocrine cells exist as a single principal islet in the head of the pancreas. At larval stages, additional endocrine cells are added by differentiation of extra-pancreatic ductal cells and proliferation within the principal islet (Dong et al., 2007; Pisharath et al., 2007). Around 6 days post-fertilization (dpf), progenitors located in the pancreatic duct start to differentiate to form smaller secondary (2°) islets. At this early stage, 2° islets consist of one or more endocrine cells that form within the tail of the pancreas (Biemar et al., 2001; Wang et al., 2011; Ninov et al., 2012). These easily visualized features of zebrafish pancreatic development can be used to delineate the specific effect(s) of exogenous factors on β-cell biology. For instance, the appearance of ‘precocious’ 2° islets before 6 dpf is an indication of induced endocrine differentiation (Rovira et al., 2011). Conversely, an increase in principal islet cell numbers, in the absence of effects on endocrine differentiation (e.g., 2° islet formation), suggests stimulation of endocrine cell proliferation. We previously visualized precocious 2° islet formation in a manual chemical screen of a library of largely FDA-approved drugs (Johns Hopkins Drug Library; JHDL) to identify six compounds that induced endocrine differentiation (Rovira et al., 2011). Here, we developed a reporter-based strategy for identifying compounds that increase β-cell mass at high-throughput rates. By labeling β cells with a fluorescent protein and quantifying changes in fluorescence after exposure to JHDL compounds, many more drugs were identified that induced endocrine differentiation and/or stimulated proliferation of β cells. Most whole-organism drug discovery efforts to date have relied on manual assays or high-content screening (HCS). These approaches attain only mid-throughput rates, thus, in vivo drug screens have typically been limited to small sample sizes and screening compounds at a single concentration (Mathias et al., 2012). Ideally, false-call rates could be minimized by using ‘statistical power’ to establish appropriate sample sizes (Ellis, 2010; Grissom and Kim, 2011; Halsey et al., 2015) and by testing compounds at multiple concentrations, a strategy called ‘quantitative HTS’ (qHTS; [Inglese et al., 2006]). However, due to increased volume demands, applying such strategies to whole-organism drug discovery requires methods for evaluating compounds at HTS rates in vivo. Toward that end, we previously adapted existing HTS instrumentation, specifically a microplate reader, to the task of quantifying fluorescent reporters in living zebrafish, termed automated reporter quantification in vivo (ARQiv; (Walker et al., 2012). ARQiv provides purely quantitative data whereas HCS typically produces images, thus, more complex data. However, offsetting any comparative reduction in data complexity, ARQiv significantly increases throughput capacity. Indeed, ARQiv assays can be performed at a pace equivalent to in vitro HTS; an upper limit of 200,000 organisms per day, per plate reader (Walker et al., 2012). Accordingly, ARQiv enables optimal HTS practices, such as qHTS, to be applied to whole-organism drug discovery. Here, we have combined ARQiv with a custom-designed robotics system to enable the first truly high-throughput whole-organism drug screen in a vertebrate model (ARQiv-HTS). We analyzed a zebrafish transgenic line in which β cells are labeled with (Yellow Fluorescent Protein) YFP and neighboring delta (δ) cells are labeled with RFP (Walker et al., 2012). The goal of the primary screen was to identify drugs that increased β-cell reporter activity relative to vehicle only controls, thus, compounds that potentially increased β-cell mass. Secondary confirmation screens were designed to determine whether potential hit drugs induced endocrine differentiation (precocious secondary islet formation) or stimulated β-cell proliferation (increased β-cell numbers in the absence of effects on differentiation). Our results revealed: (1) ARQiv can be applied at HTS rates. Over 500,000 transgenic larvae were evaluated in the primary screen and can detect small differences in the number of fluorescently labeled cells; (2) qHTS can be effectively applied to whole-organism drug discovery. All JHDL compounds were tested at six different concentrations and a sample number of 16 per condition; (3) new purposes for FDA-approved drugs in increasing β-cell mass. We validated 11 drugs that induced endocrine differentiation and 15 drugs that stimulated β-cell proliferation (two compounds had activity in both assays); and (4) novel roles for NF-κB signaling in regulating pancreatic progenitor differentiation and for serotonergic signaling in selectively stimulating β-cell proliferation. Due to the near limitless number of reporter-based assays applicable to ARQiv-HTS―that is, anything involving a change in reporter intensity―we anticipate this approach will become a useful platform for whole-organism drug discovery and development. Our first goal was to develop a HTS-compatible reporter-based assay for identifying compounds that increase pancreatic β-cell mass in vivo. Toward that end, we established a dual-reporter transgenic line, Tg(ins:PhiYFP-2a-nsfB, sst2:tagRFP)lmc01 (β/δ-reporter) in which the insulin (ins) promoter drives expression of a yellow fluorescent protein (PhiYFP) in β cells, and the somatostatin 2 (sst2) promoter drives a red fluorescent protein (TagRFP) in adjacent δ cells (Figure 1A,B; (Walker et al., 2012). We reasoned that the β/δ-reporter line would allow us to detect compounds affecting endocrine differentiation and/or proliferation of β cells or their progenitors since both would cause an increase in YFP reporter signal (Figure 1C). Expressing RFP in δ cells secondarily could facilitate identification of compounds that selectively increased β-cell mass (>YFP only) vs expansion of endocrine tissue in general (>YFP and >RFP). We tested whether a chemical inhibitor of γ-secretase (DAPT), an enzyme necessary for Notch signaling, could serve as a positive control. Prior studies had shown that inhibition of Notch signaling promoted precocious 2° islet formation and thereby increased insulin reporter activity (Parsons et al., 2009). We therefore adapted a protocol used to manually screen for precocious 2° islet formation at 5 dpf (Rovira et al., 2011) to the task of detecting increased β-cell numbers (>YFP fluorescence) via ARQiv. Screening resources, design, and controls. (A) Transgenic line used for the primary screen, Tg(ins:PhiYFP-2a-nsfB, sst2:tagRFP)lmc01 (β/δ reporter; Walker et al., 2012), the insulin promoter drives YFP-expression in β cells (yellow), the somatostatin 2 promoter drives RFP expression in neighboring δ cells (red). Photomicrograph of the anterior region of a 7 dpf larva shows YFP and RFP labeling of the principal islet (arrow). (B) Confocal z-projection of the principal islet in a β/δ-reporter fish (scale bar: 10 µM), YFP labeling β cells (yellow) and RFP labeling δ cells (red)—note, apparent ‘orange’ co-labeling is an artifact of z-projection in 2D format. (C) Illustration of two potential mechanisms by which drug exposures could lead to increased β-cell mass: (1) enhanced endocrine differentiation, indicated by secondary (2°) islet formation (left path) and (2) increased β-cell proliferation, indicated by supernumerary β cell numbers in the principal islet (right path) in the absence of effects on endocrine differentiation—that is, no effect on 2° islet formation. (D) Schematic of the ARQiv-HTS screening process: Day 0, mass breeding produced 5000–10,000 eggs per day; Day 2 (evening), JHDL compounds were serially diluted into drug plates; Day 3, the COPAS-XL (Union Biometrica) was used to dispense individual 3 dpf larvae into single wells of drug plates, and plates were then maintained under standard conditions for 4 days; Day 7, larvae were anesthetized and reporters quantified by automated reporter quantification in vivo (ARQiv). (E) β/δ-reporter larvae were exposed to 0.1% DMSO (negative control) or the γ-secretase/Notch inhibitor DAPT (positive control) at six different concentrations from 3 to 7 dpf. ARQiv was then used to measure fluorescent signals from β cells (yellow line, left y-axis) and δ cells (red line, right y-axis). The DAPT to DMSO ratio (DAPT/DMSO) was used to indicate signal strength for each fluorophore independently, as per the primary screen. The β-cell data show a non-monotonic dose response (yellow dashed line, polynomial curve fit), with maximal signal observed at 25–50 μM DAPT. The δ-cell data show a similar trend (red dashed line, polynomial curve fit), but with approximately fourfold lower signal strength due to higher autofluorescent background in the RFP emission range. To determine an optimal dosage, DAPT was titrated across a twofold dilution series (from 200 µM to 6.25 µM) and used to treat β/δ-reporter larvae for 2, 3, and 4 days starting at 3 dpf. Reporter signals induced by DAPT treatment were compared to vehicle only negative controls (0.1% DMSO). This analysis determined that a 4-day exposure (3–7 dpf; Figure 1D) achieved reporter signal levels necessary for HTS. The data also validated the utility of DAPT as a positive control for inducing increased YFP signal (maximal DAPT/DMSO ratio of >5.5) and to a lesser extent for RFP (maximal DAPT/DMSO ratio of >1.25, see Figure 1E). Dose-response curves show concentration-dependent effects for both cell types, with maximal responses at 25–50 μM. To assess assay quality, establish appropriate sample sizes, and set ‘hit’ call criteria, we used statistical methods developed for HTS that account for increased signal variability attending in vivo assays (see ‘Materials and methods’, and [White et al., 2015]). To generate large data sets for this analysis, 192 individual positive (DAPT) and negative (DMSO) control assays were performed. Strictly standardized mean difference (SSMD) calculations were used to determine assay quality, set a hit call cut-off, and as a means of comparing effect size across compounds (Zhang, 2011). This analysis determined that our assay was of high enough quality to pursue HTS (robust SSMD* score of 1.67). The sample size calculation (Ellis, 2010; Grissom and Kim, 2011), using power and significance values minimizing false-call rates (99.9% and p = 0.001, respectively), determined that a sample number of 14 was sufficient to detect a 50% effect size (i.e., half as potent as the DAPT positive control). However, to account for occasional automation errors, and in keeping with 96-well plate layouts, we elected to screen 16 larvae per compound concentration. Due to greater background autofluorescence in the RFP emission range, a sample size of 16 was predicted to be insufficient for detecting a 50% effect size on δ cells. Thus, we limited the use of RFP data to a simple comparison between YFP and RFP dose-responses, rather than as a ratiometric standard. Bootstrapping (random sampling with replacement) of the positive and negative control data sets at a sample size of 16 resulted in a predicted SSMD score of 1.3 for an effect size of 50% relative to the positive control. Accordingly, we set the SSMD ‘hit’ selection cut-off at ≥1.3. After defining the sample size and hit criterion, we initiated a full-scale screen of the JHDL (Chong et al., 2006b, 2006c) using the ARQiv-HTS system (Figure 1—figure supplement 1A,B). The JHDL is a collection of 3348 compounds, comprised largely of drugs approved for use in humans (Shim and Liu, 2014). Screening the JHDL served three purposes: (1) tested the value of whole-organism qHTS by screening the same library as our prior manual screening effort (Rovira et al., 2011), (2) provided an enriched number of biologically active compounds with defined mechanisms of action, and (3) facilitated the identification of existing drugs as potential new treatments for diabetes. Moreover, drug repurposing has the potential to fast track delivery of new therapeutics to the clinic (Shim and Liu, 2014). Custom-designed mass breeding units were used to maximize egg production (White et al., 2015). The number of viable eggs on day 1 established the number of drugs to be tested per session. The evening of day 2, robotic plate and liquid handling systems (Hudson Robotics) were used to titrate all JHDL compounds across a twofold dilution series from 4 μM to 125 nM in 0.1% DMSO, thus, testing a total of six different concentrations (Figure 1D) per qHTS principles (Inglese et al., 2006). At a sample size of 16 per condition, this equated to each drug being arrayed across an entire 96-well plate. DAPT and DMSO control plates bracketed each subset of 10 drug plates (Figure 1—figure supplement 1C). On day 3, the COPAS-XL system (Complex Object Parametric Analyzer and Sorter, Union Biometrica) was used to automate dispensing of individual 3 dpf β/δ-reporter larvae into single wells of 96-well plates containing pre-diluted drug solutions; all plates were then incubated under standard conditions. After a 4-day treatment regimen, 7 dpf larvae were anesthetized and fluorescent reporter levels were quantified by ARQiv (Figure 1D). We developed an R script for processing and plotting ARQiv data in near real-time to flag plates containing potential hit compounds. This was done to facilitate immediate visual follow-up of larvae in potential hit plates using standard microscopy to eliminate false positives, such as increased autofluorescence due to toxicity, and as an initial assessment of effects on 2° islet formation. Three graphical outputs were plotted: (1) standard box plots, Drug over DMSO (Drug/DMSO) signal ratios to reveal dose-responses and variability, (2) SSMD hit scores, as a means of comparing effect size and to flag compounds of interest (those in which at least one concentration achieved an SSMD ≥1.3), and (3) heat maps, to guide initial visual follow-ups to assess 2° islet formation (Figure 2A–C). ARQiv data and screen flow chart. (A–C) Example of MATLAB/R-generated real-time data plots provided for each drug plate; note, data for YFP are shown; however, plots were provided for both fluorophores. (A) Boxplots of Drug to DMSO signal ratio (Drug/DMSO) provided dose–response and variance data. (B) Strictly standardized mean difference (SSMD) scores were used to rank compounds according to relative strength; black line shows the 1.3 cut-off used to implicate compounds of interest (i.e., ‘hit calls’). (C) Heat maps facilitated same day visual evaluation of each hit call plate. (D) Screening process—drug discovery results: the numbers of compounds tested, implicated (Hits I and II), and validated (Leads I and II) are listed at each stage. In addition, hit calls that were eliminated from further analysis due to being either fluorescent (29 compounds) or toxic (19 compounds), and others which remain to be further evaluated (131 compounds), are indicated by diagonal dashed arrows. (E) Screening process—assays utilized: schematic showing primary and secondary screening processes. In keeping with the high-throughput screening (HTS) practice of confirming implicated compounds in ‘orthogonal’ assays, different transgenic reporter lines were used for the following (progressing from the top): (1) the primary screen and initial 2° islet evaluation (β/δ-reporter), (2) validating effects on endocrine differentiation (pan-endocrine GFP reporters), and (3) validating of effects on β-cell proliferation (β-cell nuclear reporters). After screening more than 500,000 β/δ-reporter larvae, 225 compounds (6.7%) produced an SSMD ≥1.3 and were designated as ‘hit calls’ (Figure 2D). Corresponding plates underwent an initial visual assessment. 29 hit call compounds proved to be autofluorescent, another 19 negatively impacted fish viability and/or morphology. These 48 compounds were designated as false positives and eliminated from further evaluation (Figure 2D). The remaining 177 hit call plates were further examined for evidence of enhanced 2° islet formation (Parsons et al., 2009; Rovira et al., 2011). Increased 2° islet formation was observed in 23 plates (Figure 2D, ‘Hit I’ subset; Figure 2—figure supplement 1, Supplementary file 1). These 23 Hit I compounds were deemed most relevant for secondary validation assays involving a more direct test of endocrine differentiation effects, precocious 2° islet induction (Parsons et al., 2009; Rovira et al., 2011). The other 154 hit call plates displayed no preliminary evidence of enhanced 2° islet formation. To account for other mechanisms that could result in elevated insulin reporter activity, we examined a second group of 23 strongly implicated drugs (SSMD values ≥1.75, Figure 2D, ‘Hit II’ subset) for evidence of increased β-cell numbers in the absence of differentiation effects (Figure 2E; Supplementary file 1). A residual 131 compounds await further evaluation (Supplementary file 2). The majority of the 46 Hit I and Hit II compounds underwent a series of ‘validation assays’ to confirm effects on endocrine differentiation and/or β-cell proliferation. In keeping with common HTS practices, secondary assays were performed with complementary toolsets rather than the β/δ-reporter line used in the primary screen in order to independently confirm the findings of the primary screen. In preliminary visual evaluations to assess endocrine differentiation effects in larvae within hit call plates, considerable variability was noted. Typically, additional 2° islets were observed only in a subset of treated larvae among a given hit call condition (Figure 2—figure supplement 1C). This is likely due to the β/δ-reporter being less than ideal for detecting endocrine differentiation effects; reporters are linked to late-stage differentiation of β and δ cells, which are only just beginning to appear in 2° islets at 7 dpf (Parsons et al., 2009). The requirement of a 4-day chemical exposure to observe expression differences in the β/δ-reporter line via ARQiv reflects this issue. Conversely, we have shown that transgenic lines labeling early endocrine progenitors are useful for identifying compounds that induce endocrine differentiation as early as 5 dpf (Rovira et al., 2011). Therefore, in keeping with the practice of using ‘orthogonal’ assays to confirm the activity of compounds implicated in primary screens (Thorne et al., 2010), we tested Hit I compounds in transgenic backgrounds better suited to visualizing 2° islets. In particular, we used the pan-endocrine reporter line, Tg(neurod:EGFP)nl1 (Obholzer et al., 2008; Dalgin and Ward, 2011), to confirm the efficacy of ‘Hit I’ drugs for inducing early endocrine differentiation. In this line, GFP is expressed in nascent endocrine cells, permitting the detection of ‘precocious’ 2° islet formation at 5 dpf after 2-day drug exposures, akin to our previous manual screen (Rovira et al., 2011). A subset of Hit I compounds (20 of 23) was tested accordingly. An alternative Notch pathway inhibitor, RO4929097 (5 μM, Selleck Chemicals; Luistro et al., 2009), was used as the positive control. Our prior studies had shown that RO4929097 functions equivalently to DAPT for this assay (Huang et al., 2014). Transgenic larvae were treated from 3 to 5 dpf with compounds across an expanded concentration range (0.5–25 μM) to account for differences with the primary assay (e.g., transgenic line used, timing and duration of compound treatment) and/or differences between compound lots. Following treatments, larvae were fixed at 5 dpf and processed for imaging by confocal microscopy. As GFP expression is widespread throughout the endoderm in the neurod:EGFP line, pancreata of treated fish were micro-dissected. High-resolution imaging afforded an increased sensitivity in scoring the induction of 2° islets (Figure 3A,B). Of the 20 Hit I drugs tested, 11 were validated as inducers of endocrine differentiation (55%; Figure 3C, Figure 3—figure supplement 1). The confirmed hits were reclassified as the ‘Lead I’ drugs (Figure 2D; Table 1). Equivalent tests using a second pan-endocrine transgenic line, Tg(pax6b:GFP)ulg515 (Delporte et al., 2008), confirmed the same 11 drugs as leads (Figure 3—figure supplement 2). Validation of endocrine differentiation induction: precocious 2° islet assay. 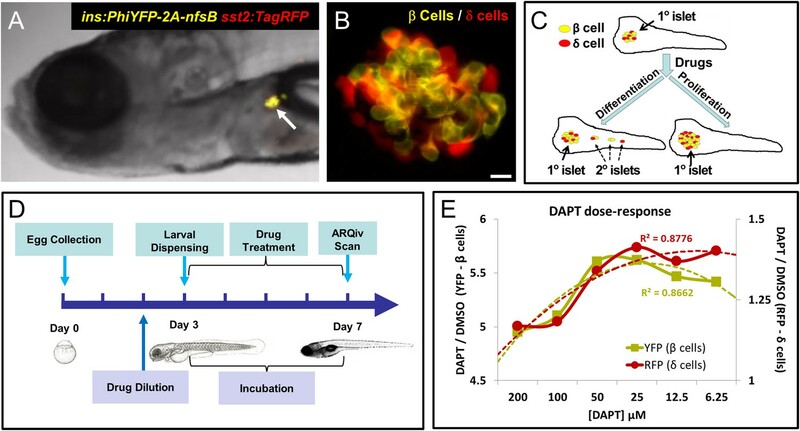 (A, B) Representative confocal images—brightfield and fluorescence images merged—of dissected pancreata (dashed lines) from neurod:EGFP transgenic larvae treated from 3 to 5 dpf with 0.1% DMSO (A) or a Hit I drug (B, example shown is parthenolide). Early endocrine cells are labeled with GFP (green) allowing precocious formation of 2° islets (white arrows) to be visualized following drug exposures. (C) The number of precocious 2° islets was quantified following treatment with the indicated Hit I compounds from 3 to 5 dpf. Results obtained with the optimal concentration were plotted relative to negative (0.1% DMSO) and positive controls (RO2949097, 5 μM). Of 20 Hit I compounds tested, 11 were confirmed as Lead I drugs for inducing endocrine differentiation (optimal concentrations for validated leads are shown in parentheses). Arrows indicate drugs that inhibit NF-κB signaling. Scale bar, 25 μm. Error bars, standard error. All p-values were calculated using Dunnett's test. *p < 0.05, **p < 0.01, ***p < 0.001, ****p < 0.0001. n = 5–10 larvae per condition, experiment was repeated 3 times per compound. The 23 Hit I drugs are listed. 20 were tested for induction of endocrine differentiation, that is, precocious 2° islet formation. Compounds are ordered according to the results of the validation screen, 11 drugs were confirmed as leads (++ = p < 0.01′; + = p < 0.05), 9 failed (−). *optimal response concentration for the ARQiv and validation screens. n/a: not applicable; nd: not determined, n = 5–10 larvae per condition, experiment repeated 3 times. Of the original ARQiv Calls, 154 compounds showed no preliminary evidence of enhanced 2° islet formation. However, many of these drugs had high SSMD scores suggesting substantial biological significance. We hypothesized that increased β-cell mass in the principal islet would also have been reported as increased insulin reporter activity (YFP) during the primary screen. Furthermore, any increase in β-cell mass in the absence of effects on endocrine differentiation would suggest a capacity to induce β-cell proliferation (Figures 1C, 2D,E). Discovery of drugs promoting β-cell proliferation would have obvious implications for treating diabetic conditions associated with β-cell paucity. 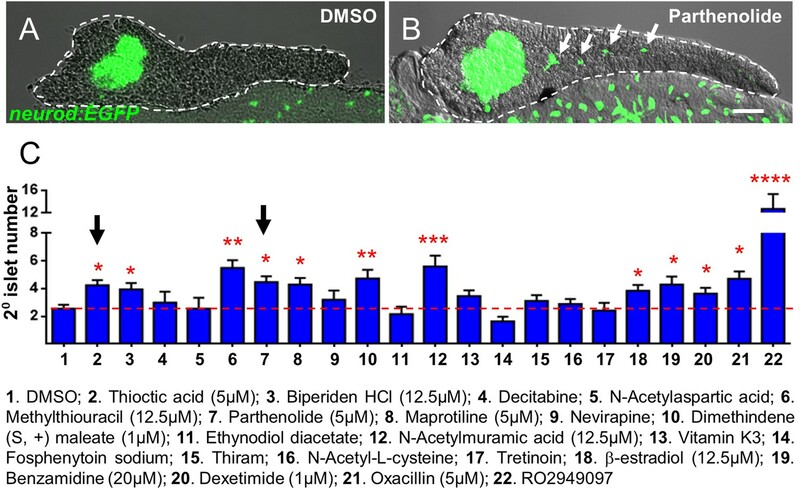 To prioritize which drugs to screen for increases in β-cell number within the principal islet, we chose a threshold SSMD score of 1.75, denoted as the Hit II subset (Figure 2D). Of 23 drugs that met this criterion, we were able to perform validation assays on 19. We also included the 9 Hit I drugs that failed to induce 2° islet formation, and two validated Hit I compounds with an SSMD >1.75; thus, a total of 30 compounds (Figure 2D). In β/δ-reporter transgenic fish, YFP is expressed in β-cell cytoplasm, making it difficult to count cell numbers accurately, (Figure 1B). To facilitate detailed quantification of β-cell numbers, we turned to a transgenic line in which GFP is expressed in β-cell nuclei, Tg(ins:hmgb1-EGFP)jh10 (Wang et al., 2011). All compounds were tested as per the treatment regimen established for Validation assay I. The data showed that 15 compounds (50%) caused a significant increase in β-cell number at the optimal tested concentration (Figure 4A). Hits confirmed for the ability to stimulate increased β-cell numbers in the absence of effects on differentiation were reclassified as ‘Lead II’ drugs (Figure 4A; Table 2). Validation of increased β-cell proliferation: cell counts. (A) Quantification of β-cell numbers following incubation of ins:hmgb1-EGFP transgenic larvae from 3 to 5 dpf in one of 30 Hit compounds, 0.1% DMSO, or the Notch inhibitor RO4929097 (5 µM). 15 compounds were confirmed as Lead II drugs for increasing β-cell numbers. Arrows indicate drugs that enhance serotonin signaling. (B, C) ARQiv screen data for paroxetine: box plots of β cells (B) and δ cells (C) suggest a β cell-specific effect—that is, a dose–response in YFP but not RFP signal (dashed line, single polynomial curve fit). (D) Numbers of δ cells (red bars) and β cells (green bars) were quantified following treatment with paroxetine, 0.1% DMSO, or RO4929097. Increased β-cell numbers were seen following paroxetine and RO4929097 treatments. However, only RO4929097 increased both β and δ cells. (E) Ratio of the number of β cells to δ cells, which confirms that the number of β cells increases following paroxetine treatment relative to δ cells, suggesting cell-type selective effects. Error bars, standard error. n = 5–10 larvae per condition, experiment was repeated 2–3 times per compound. (F–H) Representative z-projection confocal images of the principal islets in dissected pancreata (post-paraformaldehyde fixation) fromTg(ins:hmgb1-EGFP; β/δ-reporter ) triple transgenic lines treated with DMSO (F), paroxetine (G), or RO4929097 (H). Shown are EGFP+ β-cell nuclei (green) and TagRFP+ δ cells (red); note, PhiYFP in the β/δ-reporter line does not withstand fixation, allowing ‘clean’ labeling of β-cell nuclei with EGFP. In addition, apparent overlap between the β-cell and δ-cell markers (i.e., occasional ‘yellow’ cells) is an artifact of z-projection images shown in 2D format. For clarity, the inset panels show a single z-slice image of partial islet showing no co-localization of cell type specific reporters. All p-values were calculated using Dunnett's test. *p < 0.05, **p < 0.01, ***p < 0.001, ****p < 0.0001. N.S., non-significant. Scale bar, 10 μm. All 23 Hit II drugs (non-shaded), as well as 2 Hit I validated compounds with high SSMD values (shaded light gray), and 9 Hit I ‘fails’ (shaded dark gray), are listed. The top 30 drugs were tested for increased β-cell numbers: 15 were validated as leads (++++ = p < 0.0001; +++ = p < 0.001; ++ = p < 0.01; + = p < 0.05), 15 failed (−). *optimal response concentration for the ARQiv and validation screens; **substituted compound due to availability issues; n/a: not applicable; nd: not determined. n = 5–10 larvae per condition, experiment repeated 2–3 times. Of the leads that increased β-cell number, paroxetine was particularly intriguing as comparisons between β-cell and δ-cell reporter activity suggested that this drug might selectively increase β-cell numbers without affecting δ-cells, that is, potentially acting in a cell type-specific manner (Figure 4B,C). To verify that the actions of paroxetine were specific to β cells, we treated double transgenic (ins:hmgb1-EGFP; β/δ-reporter) larvae with paroxetine at the optimal concentration (1 µM) from 3 to 5 dpf and quantified β and δ cells using confocal microscopy. DMSO treated larvae had an average of 29.4 ± 1.1 β cells and 24.1 ± 1.6 δ cells. As expected, RO4929097 treatment caused a significant increase in both endocrine cell types examined (35.8 ± 1.3 β cells and 29.7 ± 1.5 δ cells; Figure 4D–H), consistent with DAPT treatment in the ARQiv assay (Figure 1E) and likely due to induced differentiation of progenitors contributing to the principal islet. Conversely, paroxetine significantly increased β-cell numbers (37.1 ± 1.4, p < 0.01) but had no effect on δ cells (23.0 ± 1.1, p = 0.57) (Figure 4D–H). This result suggests that it is possible to increase β-cell mass without incurring concomitant increases in other endocrine compartments, an important finding with respect to the development of targeted therapies. One of the central advantages of screening clinically approved drugs is that molecular mechanisms of action are typically well characterized. Thus, having validated several compounds for the capacity to induce endocrine differentiation (Table 1) and/or β-cell proliferation (Table 2), we next sought to investigate whether shared mechanisms of action were implicated between drugs eliciting the same effect on pancreatic biology, that is, among compounds within the Lead I or Lead II sets. Two of the 11 drugs in the ‘Lead I’ set, thioctic acid and parthenolide, are known inhibitors of the NF-κB signaling pathway (Ying et al., 2010; Ghantous et al., 2013). This inspired us to ask whether these drugs enhance endocrine differentiation by modulating NF-κB signaling. In quiescent cells, the NF-κB complex is sequestered in the cytoplasm and associates with inhibitory IκB proteins (Schmitz et al., 2004). Activation of NF-κB signaling leads to kinase-dependent phosphorylation and degradation of IκB, allowing NF-κB to translocate to the nucleus and regulate target-gene transcription (Schmitz et al., 2004). Despite having different molecular targets, thioctic acid and parthenolide both block NF-κB nuclear translocation (Ying et al., 2010; Ghantous et al., 2013). To further validate the NF-κB pathway as a target for stimulating endocrine differentiation, we used two other compounds, not present in our chemical library, but known to inhibit NF-κB signaling at different steps in the pathway: NF-κB inhibitor II (NFκBi-II) blocks the target transcription without affecting IκB degradation (Shin et al., 2004); and NF-κB I inhibitor III (NFκBi-III) inhibits cytokine-stimulated NF-κB activation (Lee et al., 2005). Neurod:GFP larvae were used to determine effects on 2° islet appearance following incubation (3–5 dpf) with either NFκBi-II (1 µM) or NFκBi-III (10 µM). Initial working concentrations of these compounds were based on previous studies (Shin et al., 2004; Lee et al., 2005). Dosages were then decreased until concentrations that did not induce morphological defects were defined. Treated larvae showed significant increases in the 2° islet number with both NFκB inhibitors (Figure 5A–D). From this work, it is clear that targeting multiple steps in the NF-κB signaling pathway results in precocious 2° islet formation, and therefore, β-cell neogenesis. Using a previously characterized NF-κB reporter transgenic line, Tg(6xNFκB:EGFP)nc1 (Kanther et al., 2011), we confirmed that 2-day treatments (3–5 dpf) with thioctic acid, parthenolide, as well as NF-κB inhibitors II and III dramatically reduced NF-κB reporter activity in the pancreas and globally (Figure 5—figure supplement 1). We next sought to confirm that NF-κB inhibition could induce endocrine differentiation. Larvae from the pan-endocrine reporter line, neurod:EGFP (Figure 5A–C), showed a significant increase in 2° islet number when treated with either inhibitor. This result clearly demonstrates that targeting the NF-κB signaling pathway results in precocious 2° islet formation, thus, β-cell neogenesis through induction of endocrine differentiation. NF-κB pathway inhibition induces endocrine differentiation. (A, B) Representative confocal images—brightfield and fluorescence images merged—of dissected pancreata (dashed lines) from neurod:EGFP transgenic larvae treated from 3 to 5 dpf with NF-κB signaling inhibitor II (A) or III (B). Both inhibitors induced precocious secondary islet formation (white arrows). (C) Secondary islet numbers were quantified and plotted relative to vehicle control (0.1% DMSO). n = 5–10 larvae per condition, experiment was repeated 3 times. Error bar, standard error. All p-values were calculated using Dunnett's test. ****p < 0.0001. (D, D′) Representative in vivo confocal z-projection of pancreas (dashed lines) in 6xNFκB:EGFP ;Tp1:hmgb1:mCherry double transgenic larvae at 5 dpf showing co-labeling of the NF-κB reporter (green) and Notch reporter (red) in endocrine progenitor cells (arrows in D′), suggesting endocrine progenitors respond to both Notch and NF-κB signaling. Scale bars, 25 μm (D), 10 μm (D′). Having established that NF-κB is involved in the regulation of endocrine differentiation, we sought to identify which pancreatic cell types are actively undergoing NF-κB signaling during development. To do so, pancreata from double transgenic fish carrying NF-κB and Notch pathway reporters (6xNFκB:EGFP; tp1:hmgb1-mCherry) (Parsons et al., 2009; Kanther et al., 2011) were imaged using confocal microscopy. We found that the NF-κB reporter signal (GFP) overlapped with the Notch-pathway dependent signal (mCherry) at 5 dpf (Figure 5D,D′). This indicates that NF-κB signaling is active in Notch-responsive progenitors that line the pancreatic duct, consistent with a novel role for the NF-κB pathway in endocrine differentiation. Of note, NF-κB inhibition did not appear to reduce Notch-reporter expression (Figure 5—figure supplement 1A–E), a result requiring further characterization. A potential shared mechanism of action among Lead II compounds was revealed by the fact that paroxetine and amitriptyline (Figure 4A, compounds 10 and 22, arrows; Table 2) are both predicted to increase serotonergic signaling (Dechant and Clissold, 1991; Boyer and Feighner, 1992) (Sangdee and Franz, 1979). Clinically, both drugs are used as antidepressants. Paroxetine is a selective serotonin reuptake inhibitor (SSRI), thereby increasing extracellular serotonin concentration. Amitriptyline inhibits reuptake of both norepinephrine and serotonin. We hypothesized that these drugs regulated β cells by mediating serotonergic signaling. To test this hypothesis, we evaluated fluoxetine, another SSRI, and serotonin itself. β cells were quantified following a 2-day exposure (3–5 dpf) to fluoxetine (25 μM) or serotonin (25 μM). Both treatments displayed a significant increase in β-cell numbers (fluoxetine, 42.6 ± 2.0; serotonin, 45.7 ± 2.5; DMSO, 33.7 ± 1.2) suggesting that elevated serotonergic signaling promotes β-cell proliferation (Figure 6A). Serotonin signaling stimulates β-cell proliferation in a cell type-specific manner. 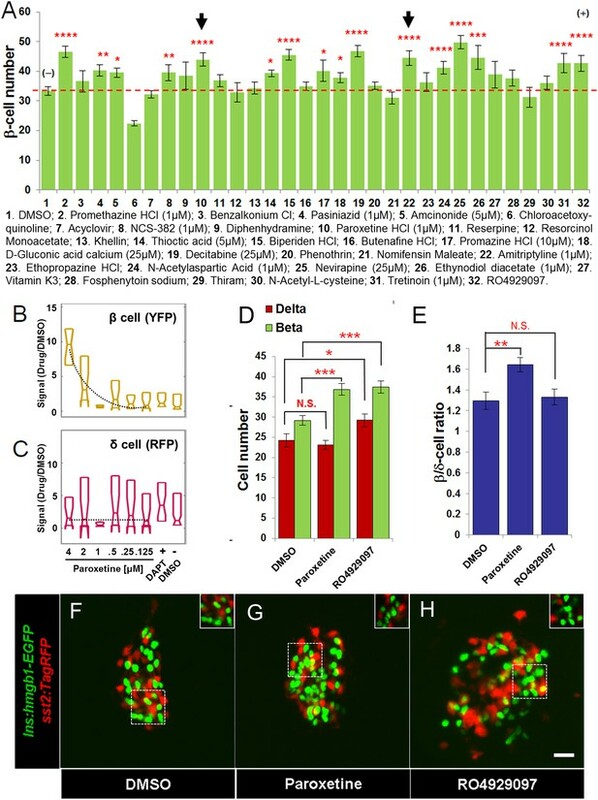 (A) β-cell quantification following 25 μM serotonin or 25 μM fluoxetine treatment of ins:hmgb1-eGFP transgenic larvae from 3 to 5 dpf indicates enhanced serotonin signaling increases β-cell numbers in zebrafish larvae. (B) β-cell quantification in the principal islet (All) and the number of EdU-labeled β cells (EdU+) are plotted following treatments with EdU and either DMSO, 1 μM paroxetine, or 5 μM RO4929097. More β cells overall, and more EdU+ β cells, are observed with 1 μM paroxetine and 5 μM RO4929097 treatments, suggesting effects on β-cell proliferation. (C) Plot of EdU+ β cells as a percentage all β cells shows that paroxetine treatment stimulates β-cell proliferation, whereas Notch inhibition does not. Error bars, standard error. (D–F) Single-plane confocal fluorescence images of ins:hmgb1-eGFP islets (dashed lines) treated with EdU and either DMSO (D), 1 μM paroxetine (E), or 5 μM RO4929097 (F)—β cell nuclei (green); EdU+ cells (red); double-labled EdU+ β cells (yellow). Scale bar, 10 μm. n = 5–10 larvae per condition, experiment was repeated 3 times. (G, G′) Confocal images of immunostained adult zebrafish pancreas indicate that serotonin signaling is active in islets (white arrows, islets indicated by dashed lines). aTub: acetylated tubulin (red); 5HT (5-hydoxytryptamine): serotonin (green); insulin (magenta). Scale bar, 10 μm. (H, I) Confocal images of adult zebrafish pancreas following injections with EdU and either DMSO (H) or 1 mM paroxetine (I), and immunostained as indicated. (J) Plot of EdU+ β cells as a percentage all β cells shows that paroxetine treatment stimulates β-cell proliferation in adult zebrafish. Error bars, standard deviation. n = 3–5 adult fish per condition, experiment was repeated 3 times. All p-values were calculated using Dunnett's test. *p < 0.05, **p < 0.01, ***p < 0.001, ****p < 0.0001. To verify effects on cell division, we combined SSRI treatments with 5-ethynyl-2′-deoxyuridine (EdU), a thymidine analog that labels proliferating cells (Salic and Mitchison, 2008). We used another transgenic line labeling β-cell nuclei with GFP, Tg(ins:hmgb1-EGFP)jh10, to facilitate quantification of EdU-labeled cells. Larvae were exposed to compounds and EdU for 2 days (3–5 dpf), then fixed and sectioned for imaging. As expected, the results show increased numbers of β cells in principal islets of larvae treated with paroxetine (37.1 + 1.2) and RO4929097 (44.1 + 2.2), relative to DMSO (29.7 + 1.4; Figure 6B). Increased numbers of proliferating (EdU+) β cells were also observed for both paroxetine and RO4929097 (Figure 6B, EdU+). However, when adjusted for absolute numbers of β cells, only paroxetine-treated larvae showed a significantly higher percentage EdU+ β cells (23.7 ± 2.7%, vs 11.0 ± 1.5% and 15.6 ± 2.1% for DMSO and RO4929097, respectively; Figure 6C–F). Combined with our data suggesting paroxetine acts directly on β cells (Figure 4B–F), these results strongly suggest that enhanced serotonergic signaling promotes proliferation of β cells. Serotonin is known to be expressed in human (Eriksson et al., 2014) and mouse (Kim et al., 2010; Ohara-Imaizumi et al., 2013) islets and is implicated in regulating β-cell proliferation during pregnancy (Kim et al., 2010) and glucose-stimulated insulin secretion (Ohara-Imaizumi et al., 2013). Others have shown that serotonin influences insulin secretion (Isaac et al., 2013), and consequently glucose levels. In different model systems, elevated glucose levels have been shown to impact β-cell proliferation (Porat et al., 2011) and differentiation (Maddison and Chen, 2012). We wanted to know, therefore, whether serotonin signaling directly affects β-cell proliferation in zebrafish larvae or whether its impact is mediated through increased glucose levels. Using a colorimetric assay to quantify larval glucose levels, paroxetine incubation from 3 to 5 dpf demonstrated no effect on larval glycemia—albeit transient increases on days 1 or 2 of treatment cannot be excluded. Indeed of all leads tested, only the glucocorticoid amcinonide significantly elevate glucose levels (Figure 6—figure supplement 1). Thus, we conclude that serotonin promotes increased β-cell numbers independent from affecting glucose levels. Although serotonin was shown to be present in a subpopulation of cells in the zebrafish intestine, no report has been made regarding its localization in the adult zebrafish pancreas (Uyttebroek et al., 2010, 2013). Using a validated serotonin antibody (Uyttebroek et al., 2010), we found this molecule localized to adult pancreatic islets (Figure 6G,G′). Immunolabeling was evident along a serotonergic nerve that appeared to innervate the pancreas (indicated by overlap with anti-tubulin staining, that is, ‘yellow’ regions in merged image, Figure 6G) and was also consistent with possible expression within β cells (overlap with insulin, compare Figure 6G,G′). The observed expression pattern for serotonin is consistent with immunohistochemistry data from human pancreatic tissue and mammalian model systems. To test if serotonergic signaling also enhances proliferation in the adult zebrafish, we injected mature fish (>3 month old) with a 20 µl mixture of paroxetine (1 mM) and EdU (25 µM) every other day for 10 days (5 injections), followed by an injection of EdU alone on day 12. Fish were sacrificed on day 14 and pancreata sectioned and immunostained for insulin and EdU. The data show a significant increase in EdU+/insulin+ cells in paroxetine-treated fish (3.7-fold, p < 0.05; Figure 6H–J). Finally, to check if the effect of paroxetine is conserved in mammals, we performed intraperitoneal injections of paroxetine (15 mg/kg) in young mice daily from the age of postnatal day 6 (P6). EdU intraperitoneal injections (60 μg per injection) were carried out every other day from P8. Pancreata were then collected at P14 and P21 for staining of β cells (Nxk6.1 antibody) and EdU. The data showed a significant increase in β-cell proliferation in paroxetine-treated animals at P14 (DMSO control: 11.2 + 0.4%, n = 4 animals; paroxetine: 13.8 + 0.4%, n = 5 animals, p < 0.0001) and P21 (DMSO: 14.8 + 0.5%, n = 5 animals; paroxetine: 18.06 + 0.4%, n = 7 animals, p < 0.0001; Figure 6—figure supplement 2). Combined with prior observations in pregnant mice (Kim et al., 2010), our data are consistent with serotonergic signaling playing an evolutionarily conserved role in regulating β-cell proliferation in the pancreas. We have established a versatile and sensitive platform for true high-throughput drug discovery in whole-organisms that is applicable to a wide range of in vivo reporter-based assays. We leveraged the high-throughput capacity afforded by ARQiv to reduce false-call rates using qHTS principles—that is, titration-based primary screening (Inglese et al., 2006). To our knowledge, this is the first time qHTS has been applied to whole-organism drug discovery utilizing a vertebrate model system. We were motivated to utilize this approach as our chemical library, the JHDL, was assembled to ‘repurpose’ existing drugs for new disease targets (Shim and Liu, 2014). Thus, a primary goal was to reveal the maximal number of novel therapeutic opportunities afforded by the JHDL, an endpoint which qHTS facilitates by reducing false negatives. Our screen was specifically designed to identify compounds that elevated transgenic insulin reporter activity in larval zebrafish. More specifically, we wanted to find drugs that increased pancreatic β-cell mass, thus, possible new therapeutics for ameliorating β-cell paucity in diabetic patients. To create a platform capable of handling high-throughput volumes, we combined ARQiv with a customized robotic workstation (Hudson Robotics) and the COPAS-XL system (Union Biometrica), which we termed ‘ARQiv-HTS’. Using this system, automated quantification of YFP reporter activity (i.e., β-cell numbers) in more than a half-million transgenic larvae resulted in the identification of 177 hit candidates. Secondary assays on a subset of prioritized hit candidates validated the majority of lead drugs tested as being able to increase β-cell numbers by induction of endocrine differentiation and/or stimulation β-cell proliferation. Compared with our prior manual screen (Rovira et al., 2011), ARQiv-HTS significantly increased the number of hits implicated (177 vs 62) and leads validated (24 vs 6). This supports the hypothesis that combining automated large-scale assay platforms, such as ARQiv-HTS, with qHTS can add significant value to whole-organism drug discovery without increasing the time required for the primary screen (Mathias et al., 2012; Hasson and Inglese, 2013; Rennekamp and Peterson, 2013). In terms of sensitivity, we estimate ARQiv was able to detect as few as ten additional β cells in the developing pancreas (e.g., from 30 to 40). We validated ∼62% of the hit compounds tested as leads (24 of 39, Figure 2D; Tables 1, 2), a high hit-to-lead validation rate for HTS-based discovery systems (Hann and Oprea, 2004). This supports the concept that whole-organism screening can overcome inefficiencies in HTS drug discovery, such as high false positive and lead compound attrition rates (Giacomotto and Segalat, 2010; Mathias et al., 2012). In support of our findings regarding candidate drugs, a recent manual screen of 883 compounds by the Stainier lab, implicated three pathways in promoting β-cell replication in larval zebrafish: retinoic acid (RA), glucocorticoids, and serotonin (Tsuji et al., 2014). We identified several compounds in those categories as well and implicated an additional 11 mechanisms of action in affecting β-cell biology (Supplementary files 1, 2). Importantly, their results support our interpretation of the data presented here regarding serotonergic signaling promoting β-cell replication. In our prior manual screen, we found that inhibition of RA signaling can maintain pancreatic progenitor cells in an undifferentiated state (Rovira et al., 2011; Huang et al., 2014). Our results, and those of Tsuji et al., have now demonstrated another role for RA (e.g., tretinoin, compound #31, Figure 4) in stimulating β-cell proliferation. Both studies also found that glucocorticoids induce β-cell proliferation (e.g., amcinonide, compound #5, Figure 4) indirectly by elevating glucose levels (Figure 6—figure supplement 1). Importantly, our screen also revealed a broader range of compound categories that potentially enhance β-cell mass (Supplementary files 1, 2). Follow-up of these candidates could suggest multiple new mechanisms for increasing β-cell numbers. Such studies will be facilitated by knowledge of implicated mechanisms of action for most of the compounds in the JHDL. As an example, we explored the role of two mechanisms of action that were potentially shared between two lead drug subsets in regulating endocrine differentiation and β-cell proliferation. A third possibility, compounds stimulating a direct increase in insulin expression without changes in β-cell number remain to be evaluated. The precocious islet assay we developed (Parsons et al., 2009; Rovira et al., 2011; Ninov et al., 2012; Huang et al., 2014) was used to confirm effects of Hit I compounds on endocrine differentiation (Figure 3, Figure 3—figure supplements 1, 2). Among 20 Hit I compounds tested, 11 were validated as Lead I drugs that promoted endocrine differentiation (Table 1). It is possible that Lead I compounds stimulated endocrine progenitor proliferation as well, further experimentation will be required to test this. In follow-up studies, we sought to identify common molecular mechanisms of these drugs. Intriguingly, we found that two Lead I compounds, parthenolide and thioctic acid, inhibit the NF-κB pathway (Ying et al., 2010; Ghantous et al., 2013). We subsequently verified that NF-κB signaling was active in pancreatic progenitors and defined a novel role for NF-κB signaling in regulating pancreatic development; inhibition of the pathway enhances endocrine differentiation. In keeping with this finding, NF-κB positively regulates expression of the pancreatic progenitor marker, SOX9, in human pancreatic cancer stem cells (Sun et al., 2013). As we and others have shown, Sox9 is an important transcription factor in the maintenance of pancreatic progenitor cells under regulation of Notch signaling (Kopp et al., 2011; Manfroid et al., 2012; Shih et al., 2012). Moreover, a recent study shows that proinflammatory cytokines activate the Notch and NF-κB signaling pathways to promote endothelial transdifferentiation to a HSC fate, indicating a requirement for inflammatory regulation of stem cell numbers (Espin-Palazon et al., 2014). Taken together, these data suggest a model where NF-κB and Notch signaling maintain transcriptional regulators essential for progenitor maintenance, including Sox9 and Hes/Hey genes, respectively (Maniati et al., 2011). We reasoned that compounds which increased β-cell numbers without concomitant effects on endocrine differentiation—that is, no evidence of precocious secondary islet formation—were acting to promote cell division. Accordingly, quantification of β cells within the principal islet was used to confirm 15 of 30 Hit II compounds as Lead II drugs for stimulating proliferation of β cells (Figure 4A). In terms of mechanism of action, two serotonin reuptake inhibitors, paroxetine and amitriptyline (Sangdee and Franz, 1979; Dechant and Clissold, 1991), were among the 15 leads promoting proliferation (Table 2). As noted above, serotonin was also implicated in a recent manual screen for factors promoting β-cell proliferation in zebrafish (Tsuji et al., 2014). However, unique to this study, our primary screen data suggested that paroxetine acts in a cell-type selective manner; increasing β-cell number without affecting δ cells (Figure 4B–H). Paroxetine is a more SSRI (Dechant and Clissold, 1991), suggesting cell-specific proliferative effects may be mediated through serotonin. This intriguing possibility was tested further by assessing the effect of serotonin and another SSRI on β-cell numbers (Figure 6A), confirmed by direct assessments of β-cell division using EdU labeling (Figure 6B–F), and supported by expression of serotonin in pancreatic islets (Figure 6G,G′). These data are in keeping with preferential uptake of serotonin in human β cells in vitro, and in the pancreas of non-human primates and rats (Eriksson et al., 2014). We went on to show that paroxetine stimulated β-cell proliferation in both adult fish (Figure 6H–J) and neonatal mice (Figure 6—figure supplement 2). Serotonin signaling also increases β-cell mass and insulin secretion in pregnant mice (Kim et al., 2010; Ohara-Imaizumi et al., 2013). It has been known for over a hundred and 50 years that the pancreas is well innervated. Consistent with a role for neuronal signaling in regulating pancreatic biology, we previously found that disruption of sympathetic innervation in mice leads to abnormal islet structure and loss of functional maturation (Borden et al., 2013). Collectively, these findings strongly suggest that neurotransmitters may play significant roles in pancreatic development and β-cell proliferation. Clinical associations between paroxetine and diabetes have been reported but are controversial, with evidence of both beneficial and detrimental effects (Weber-Hamann et al., 2006; Paile-Hyvarinen et al., 2007; Knol et al., 2008; Derijks et al., 2009). As roles for serotonin in β-cell function are also inconclusive (Isaac et al., 2013; Ohara-Imaizumi et al., 2013), further study will be required to clarify whether serotonergic signaling is a viable therapeutic target for diabetic patients. In addition, neuromodulator drugs are known to be highly promiscuous (Bianchi and Botzolakis, 2010), therefore, it will be important to test whether other neurotransmitter pathways also affect islet structure and/or β-cell proliferation. This is also emphasized by the fact that neuromodulators make up the largest subcategory among the 131 ARQiv Call compounds, which remain to be further evaluated (>20 compounds, first shaded set in Supplementary file 2). In summary, we present the first full-scale implementation of ARQiv-based whole-organism HTS. Like HCS methodologies (Pardo-Martin et al., 2010; Rihel et al., 2010; Sanker et al., 2013), ARQiv can take advantage of the versatility afforded by a wide array of reporter-based transgenic resources to provide rapid quantitative phenotyping (Walker et al., 2012). Thus, both screening strategies can surmount current ‘biological validation’ bottlenecks in drug discovery (Mathias et al., 2012). HCS approaches are extremely powerful, providing multi-dimensional data that can be used to speed hit-to-lead transition times, rapidly gain mechanistic insights (Rennekamp and Peterson, 2013), and identify promising new therapeutics (Zon and Peterson, 2005). Unlike HCS approaches, ARQiv provides only single-dimension data, quantification of reporter levels—that is, no corresponding images. However, as we have demonstrated here, ARQiv can be coupled to robotics to push the boundaries of throughput for whole-organism drug discovery. Moreover, ARQiv can detect extremely subtle phenotypic changes (e.g., as few as ten additional β cells) using a completely non-subjective methodology (Walker et al., 2012). The increase in throughput afforded by ARQiv-HTS has potent practical benefits, supporting HTS ‘best practices’ such as qHTS (Inglese et al., 2006). By screening the JHDL at multiple concentrations, we substantially increased the number of hits implicated, thus, increasing our chances of identifying an optimal drug target for increasing β-cell mass. The majority of the validated leads, 18 of 24 (75%), are already approved for use in humans, thus, facilitating relatively rapid clinical translation of these findings. Mechanism of action investigations revealed two important signaling pathways affecting β-cell biology: NF-κB was implicated in regulating endocrine differentiation, and serotonergic signaling was shown to selectively stimulate β-cell proliferation. Studies in human pancreatic cells could establish if the function of these pathways is conserved, better define the roles of inflammatory and neurotransmitter modulation in pancreatic biology, and help to determine the degree to which these findings have clinical relevance. All studies were carried out in accordance with onsite ACUC protocols. All fish were maintained at 28.5°C with a consistent 14:10 hr light: dark cycle. Transgenic lines used were Tg(ins:PhiYFP-2A-nsfB, sst2:TagRFP)lmc01 (‘β/δ-reporter’; (Walker et al., 2012), Tg(pax6b:GFP)ulg515 (Delporte et al., 2008), Tg(neurod:EGFP)nl1 (Obholzer et al., 2008), Tg(6xNFκB:EGFP)nc1 (Kanther et al., 2011), Tg(ins:hmgb1-EGFP)jh10 (Parsons et al., 2009), Tg(tp1:hmgb1-mCherry)jh11 (Parsons et al., 2009). We screened the JHDL, a collection of 3348 compounds (Chong et al., 2006b; Rovira et al., 2011). The majority of the compounds in the JHDL are approved for use in humans: 2290 drugs approved for use by the FDA or international counterparts, another 775 drugs at various stages in clinical trials, and 66 rare drug compounds. In some cases, an active pharmaceutical ingredient (i.e., drug) was included in more than one formulation as a separate compound. However, these were tallied as a single drug, giving a total of 3131 drugs included in the JHDL collection. The salient features of the primary screen performed here are described below. Additional details of the robotics-integrated ARQiv system and the methodologies we apply in pursuing whole-organism HTS in zebrafish larvae can be found here: (White et al., 2015). (where μp, μn, σp, σn are the sample mean values and sample standard deviations of the positive and negative controls, respectively). This analysis produced a score of 1.67 with log transformed data, consistent with a ‘moderate’ control of good quality, thus, an HTS-ready assay (Zhang, 2011). (where, Zα, Zβ, σ, µp, µn represent the desired level of statistical significance, desired power, standard deviation [of control sample with greatest variance], mean of the positive control, and mean of the negative control, respectively). A power of 99.9% and p = 0.001 for type I (false negative) and type II (false positive) errors—corresponding to a Zα of 3.29 and Zβ of 3.09, respectively—was used to minimize false-call rates. This analysis determined that a sample size of 14 would be sufficient to detect a 50% effect size on β cells (YFP reporter) relative to DAPT positive controls. An R-based code we developed for plotting sample size data is provided as Source code 1. (where d¯i, si, are the sample mean and standard deviation of dijs—where dij is the difference between the measured value [usually on the log scale] of the i th compound and the median value of the negative control in the j th plate. Γ() is a gamma function). This analysis set an SSMD of ≥1.3 as the hit call cut-off criterion. For the primary screen, larvae were derived from in-crosses of homozygous β/δ-reporter fish (Walker et al., 2012). The β/δ-reporter transgene labels pancreatic β cells with yellow fluorescent protein (Phi-YFP, Evrogen) and neighboring δ cells with red fluorescent protein (TagRFP, Evrogen). At the start of each screening session, customized mass fish breeding chambers were used to collect 3000 to 15,000 eggs. At 24 hr post-fertilization (24 hpf), embryos were transferred into a 0.3× Danieu's solution containing 200 nM of 1-Phenyl-2-thiourea (PTU). PTU is a tyrosinase inhibitor, which reduces pigmentation and thereby increases signal-to-noise ratios for ARQiv assays (Karlsson et al., 2001). A customized Hudson Robotics system (Figure 1—figure supplement 1) was used to dispense and serially dilute individual JHDL stock solutions 1:2 across a 96-well plate (Greiner bio-one, #650209) such that final concentrations were 4 to 0.125 µM in 0.1% DMSO (drug solvent). Positive and negative control 96-well plates were prepared such that they bracketed every 10 drug plates, to account for changes in reporter activity over time (Figure 1—figure supplement 1C). Positive control plates consisted of six concentrations of DAPT, a Notch-signaling inhibitor that enhances precocious endocrine differentiation (Parsons et al., 2009), serially diluted 1:2 with final concentrations ranging from 200 µM to 6.25 µM. Titrating DAPT in every control plate served to account for lot and/or assay variability over the course of the screen. Negative controls consisted of an entire 96-well plate of drug solvent (0.1% DMSO). After drug and control plates had been prepared, a COPAS-XL unit (Union Biometrica, Holliston, MA) (Figure 1—figure supplement 1) was used to sort 3 dpf β/δ-reporter larvae for viability and dispense them into individual wells. All plates were then incubated under standard temperature and light cycle conditions for 4 days until reporter levels were quantified at 7 dpf (Figure 1E). 15 min prior to scanning, 10 µl of 0.2% Eugenol (Sigma) in drug solvent was added to anesthetize larvae. Larvae expressing the β/δ-reporter were analyzed using the ARQiv system to quantify insulin and somatostatin 2 reporter levels (YFP and RFP, respectively). Assay parameters were optimized for HTS as detailed in the text. In addition, plate reader detection parameters (e.g., optimal excitation/emission settings, z-dimension ‘focus’, etc) were determined empirically using previously described methods (Walker et al., 2012). Briefly, all wells were scanned in a 3 × 3 grid, with all grid regions analyzed independently. ‘Signal’ was defined as any region producing a reading greater than or equal to three standard deviations above non-transgenic control fish averages. If more than one region produced ‘signal’, these values were summed to obtain the total signal for that well. A set ‘gain’ for the plate reader was established for all scans in order to normalize data across numerous days/scans. We developed MATLAB (Walker et al., 2012) and R-based scripts to analyze and graphically present all primary screen data in real-time (for an example, see Figure 2). The resultant graphic provided results for each compound in three formats: (1) box plots showed the range of the data at each concentration; (2) SSMD values provided a measure of the relative strength of potential hits; and (3) a heat map of each plate facilitated initial visual follow-ups for detecting 2° islet formation. ARQiv data files from the primary screen were saved in an XML format and processed using MATLAB 2008a and/or R. An extraction algorithm was used to determine the total fluorescent signal of each well and tagged with experimental condition information for future analysis (Walker et al., 2012). For wells where the signal could not be detected, the maximum regional value was used. A plate parsing algorithm (Walker et al., 2012) was used to separate control and drug plates into groups and blocks. Each block consisted of 14 plates including ten drug plates and the flanking sets of positive and negative control plates. The most effective DAPT concentration was parsed out as a subset of 16 per each control plate and used in the drug plate analysis algorithm. Drug plate analysis was performed on each plate in correlation to respective control data. Each drug plate consisted of six concentrations, resulting in eight conditions total for the analysis. Graphical representations of the data were plotted as described above in the text. To ensure accurate SSMD score calculation, outliers (defined as any well having a signal value greater than three standard deviations from the median of the 16 wells comprising that condition) were removed from the calculations. Empirically, we found that outlier data correlated with blank wells, multiple fish per well, floating larvae, and dead larvae. All curves in graphed data were drawn using either a best fit (solid lines) or single polynomial curve fitting function (dashed lines). The original MATLAB code was updated to an R-based code to facilitate improved graphical outputs. The R-based code for processing a series of drug and control plates configured as described above is provided as Source code 2. MATLAB (and/or R) data plots were used to identify which conditions produced a SSMD ≥1.3. Using fluorescence stereomicroscopy, researchers then evaluated larvae in the corresponding wells (and in flanking wells) for evidence of enhanced 2° islet formation. Plates showing evidence of increased 2° islet formation were placed in the Hit 1 subset (Figure 2D). In addition, ARQiv hit calls having a SSMD ≥1.75 were placed in the Hit II subset (Figure 2D). It is important to note that this left 131 ARQiv Call compounds, those having an SSMD of 1.3–1.74 for which no immediate evidence of 2° islets was found; these remain to be further characterized (Supplementary file 2). For endocrine differentiation validation assays, two transgenic lines facilitating independent tests of Hit I compound effects on endocrine development were used; Tg(pax6b:GFP)ulg515 (Delporte et al., 2008) and Tg(neurod:EGFP)nl1 (Obholzer et al., 2008). Transgenic embryos were plated in 24-well plates with ≥15 embryos per well at 3 dpf in E3 medium. Newly purchased Hit I compounds were diluted from 25 μM to 0.4 μM in a twofold dilution series, added to 24-well plates, and incubated from 3 to 5 dpf. PTU was not required for validation screens and was therefore not used, allowing assessment of lead compounds independent of any potential effects of PTU. As previously described for endocrine differentiation assays (Huang et al., 2014), 5 μM of the Notch inhibitor RO4929097 (Selleck Chemicals) (Luistro et al., 2009) was used as a positive control. 0.1% DMSO was applied as the negative control. Larvae were fixed at 5 dpf with 4% paraformaldehyde (PFA) at 4°C overnight. Larval pancreata were dissected and imaged using a Zeiss Axiovert200M inverted microscope. GFP positive cells in the pancreatic ductal region other than the principal islet were counted as 2° islets (Rovira et al., 2011). All assays were evaluated using one-way ANOVA and p-values calculated with a post hoc Dunnett's test. n = 5–10 larvae per condition, and a minimum of three experimental repeats was performed. To validate Hit I and II compound effects in promoting increased β-cell numbers, the ins:hmgb1-EGFP (Parsons et al., 2009) line was used; this line facilitates β-cell quantification due to nuclear localization of the GFP reporter. The assay was performed similarly to validation I tests except that Hit drugs were tested from 25 μM to 0.2 μM using a 1:5 dilution series. Pancreata were dissected and imaged with a Nikon A1-si Laser Scanning Confocal microscopy under a 20× objective. β cells were counted for all Z planes using ImageJ (NIH) software. All assays were evaluated using one-way ANOVA (Analysis of Variance) and p-values calculated with a post hoc Dunnett's test. n = 5–10 larvae per condition, and a minimum of three experimental repeats was performed. Fish were fixed either in 4% PFA (5 dpf larvae) or 10% formalin (adults) at 4°C overnight. Pancreata were dissected and immunohistochemistry performed as described previously (Huang et al., 2014). Briefly, pancreata were embedded in paraffin and sectioned at 5 μm. Sections were stained with 4', 6-diamidino-2-phenylindole (DAPI) and processed for immunostaining using the following primary antibodies: serotonin (5-HT; 1:100, Rabbit polyclonal, ImmunoStar); acetylated tubulin (aTub; 1:400, Mouse monoclonal, Sigma); green fluorescent protein (GFP; 1:400, Rabbit polyclonal, Life Technologies), GFP (1:400, Mouse monoclonal, Life Technologies), DsRed (1:400, Mouse monoclonal, Clontech); insulin (1:400, Polyclonal Guinea Pig, Dako). Fluorescently conjugated secondary antibodies were diluted 1:400 dilution (Jackson ImmunoResearch Labs). Images were collected using a Nikon A1-si Laser Scanning Confocal microscopy. Free glucose level was determined in 5-day-old larvae using a glucose assay kit (BioVision). Briefly, 20 larvae were collected by removing the embryonic media and quickly frozen in liquid nitrogen. Frozen larvae were then thawed on ice and grinded thoroughly in 80 μl glucose assay buffer. Then, glucose concentration were measured and calculated following the manufactory instruction (BioVision). For direct assessment of β-cell proliferation, the Click-iT EdU Alexa Fluor 647 Imaging kit (Life Technologies) was used. For larval studies, drug treated 3 dpf larval were treated with EdU (working concentration 12.5 µM) and fixed at 5 dpf. In adult fish, 25 μM EdU in E3 medium was injected intracoelomically every other day together with paroxetine or 0.1% DMSO control for 10 days and alone on the twelfth day. In both cases, pancreata were dissected out, embedded in paraffin blocks, sectioned and stained as per the manufacturer's instructions. Images were collected with a Nikon A1-si Laser Scanning Confocal microscopy. EdU-positive β cells were counted using the ImageJ (NIH) software. All p-values were calculated using Student's t-test as comparisons were made only between a single treatment condition and the control. 20 μl of 1 mM paroxetine was injected intracoelomically into adult fish (>3 month old) every other day for 10 days. Control fish were injected with same volume of 0.1% DMSO. Fish injected with paroxetine exhibited the reported behavioral effects connected to SSRI treatment (Wong et al., 2013). Fish were sacrificed 14 days after the first injection and fixed in 10% formalin for further evaluation. Paroxetine was injected intraperitoneally daily at 15 mg/kg to wild-type mice (129/C57 mixed background) at postnatal day 7 (P7). EdU injections (60 μg per injection) were given intraperitoneally every other day from P8. Mice were sacrificed via CO2 gas (followed by cervical dislocation) and pancreata dissected out. Pancreata were immediately fixed in 4% PFA overnight at 4°C, then transferred to 30% sucrose (in Phosphate buffered saline, PBS) and left rocking overnight at 4°C. Before embedding in Optimal Cutting Temperature compound (OCT), pancreata were equilibrated in 1:1 30% sucrose:OCT overnight. Embedded tissues were sectioned and stained as previously described (Borden et al., 2013). The primary antibody, anti-mouse Nkx6.1 (Developmental Studies Hybridoma Bank), was prepared at a dilution of 1:200. Images were collected using a Zeiss LSM 700 confocal microscope. The Journal of Clinical Psychiatry 53:3–6. Journal of Medicinal Chemistry 49:2677–2680. Journal of Clinical Psychopharmacology 29:405–408. Journal of Nuclear Medicine 55:460–465. British Journal of Pharmacology 160:204–216. Current Opinion in Chemical Biology 8:255–263. Current Opinion in Chemical Biology 17:329–338. Proceedings of the National Academy of Sciences of USA 103:11473–11478. The Journal of Biological Chemistry 288:5682–5693. Pharmacoepidemiology and Drug Safety 17:577–586. Biochemical and Biophysical Research Communications 336:716–722. The Journal of Clinical Investigation 121:4685–4699. The Journal of Neuroscience 28:2110–2118. Proceedings of the National Academy of Sciences of USA 110:19420–19425. Proceedings of the National Academy of Sciences of USA 108:19264–19269. Proceedings of the National Academy of Sciences of USA 105:2415–2420. Journal of Biomolecular Screening 18:1193–1202. International Journal of Biological Sciences 10:654–663. Current Opinion in Chemical Biology 14:315–324. The Journal of Comparative Neurology 518:4419–4438. Cell and Tissue Research 354:355–370. Current Opinion in Organ Transplantation 15:124–130. The Journal of Clinical Psychiatry 67:1856–1861. Journal of Visualized Experiments In press. Optimal high-throughput screening: practical experimental design and data analysis for genome-scale RNAi research. Nature Reviews. Drug Discovery 4:35–44. International Review of Cytology 259:49–111. Thank you for submitting your work entitled “First quantitative high-throughput screen in zebrafish identifies novel pathways for increasing pancreatic β-cell mass” for peer review at eLife. Your submission has been evaluated by Fiona Watt (Senior editor), Tanya Whitfield (Reviewing editor), and three reviewers, who had also seen your previous submission. One of the three reviewers, Wenbiao Chen, has agreed to share his identity. 1) Reviewers 1 and 2 have some remaining questions concerning the underlying biology of the system. Please add extra experimental detail or discussion as requested. 2) Improve the resolution of the figures where possible. 3) The statistical analysis is a concern and needs strengthening. Re-do the statistical analysis with appropriate tests (i.e. ANOVA with post-hoc correction for multiple comparisons, rather than serial t-tests). The revision has markedly improved the manuscript. The authors have successfully addressed my concerns except for the first two. Overall, the study is interesting because 1) it is the first true HTS screen performed in a vertebrate organism; and 2) it has identified new regulators of β-cell mass. 1) The authors only partially took care of my concern that the increase of β cells in some cases may be a consequence of impaired insulin signaling. I would have been completely satisfied on this if glucose was measured within the first day of treatment, rather than after 3 days at which compensation may have run its course. A statement acknowledging this possibility should suffice. 2) The authors only partially addressed my concern on their interpretation of proliferation vs differentiation. The authors were correct that proliferation of both β cells and progenitor cells is interesting, but differentiation from replicated progenitors is still differentiation. The data in Figure 6B does not support that β cell replication plays a major role in paroxetine-induced β cell increase. If the new β cells were all from replication, only 3 β cells would have gained from 6 double-positive cells, accounting less than half of the 7 new β cells. The authors should take this into consideration. 1) The secondary islet assays. It still seems like a major part of their results depend on the increase of secondary islets from the drugs. In their rebuttal, they state that at day 7, the identification of such islets is “not robust” because of the ins/ss reporters, so they turned to the neuroD and pax6 reporters as orthogonal assays. But what I still don't quite understand is the fact that many of the drugs seem to globally increase neurod:GFP expression: in Figure 3A/B, it seems like the overall increase in neurod:GFP is not confined to the pancreas (i.e. just below the clearly shown dotted line delineating the pancreas). I can accept that there are ectopic islets in the pancreas as marked, but it just seems hard to separate this effect out from the more global effects on neuroD expression. Is there any type of histology that could increase confidence that these are truly secondary islets, and not just an artifact of the transgenic reporter system? 2) Figure 5: It is unclear to me why DMSO produces a “predictable increase in signal”; of which reporter? Also, in Figure 5F, what reporter are you referring to here? The NFκB-GFP or hmgb1-mCherry? 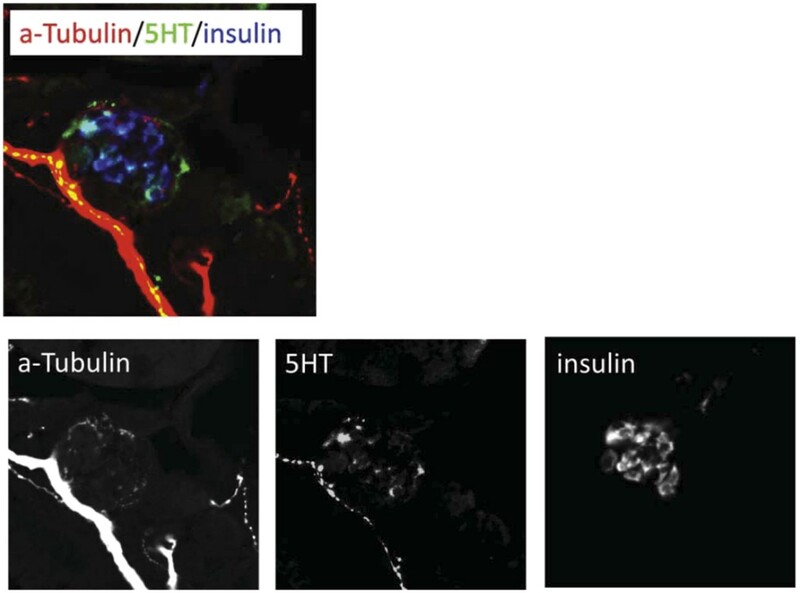 3) Figure 6G/G': The serotonin staining seems extremely widespread throughout the pancreas, and while it overlaps with insulin, there are many areas that do not. How did you validate the serotonin antibody to ensure this has any specificity in your assay? This is a much improved manuscript that is now easier to read and understand. The re-write has made clear how the whole organism HTS was done, including how big of an effect size they expected to be able to detect, how the data was analyzed, and how the screen was performed – none of which was clear in the earlier version. I appreciate the point that the hits are expected to be (hoped to be!) weaker than the positive control for biological reasons and retract my earlier concerns about this. The “high-throughputness” is most impressive and represents a significant advance. I am also more convinced in this version by the validation of serotonin and NF-κB hits, with much more details and controls (such as validation of NF-κB in the transgenic). This overall improves the manuscript and better highlights these pathways as interesting from biological and future pre-clinical screening viewpoints. 1) I disagree with the interpretation of doing serial t-tests as valid without correction. After all, if you did 100 follow up experiments and showed one test at a measly p=0.05, would you call that a real result, when such a result is quite likely by chance? No. In fact, the initial screening does take this into account with false discovery assessments, but the follow-up studies, which you might consider a “mini-screen” do not. This is incongruous. One could argue that your screen has now given you a prior expectation for a positive result, so subsequent statistical analyses can reflect this, for example, using a one-tailed t-test instead of a two-tailed one, since you actually have a prediction for the directionality of the result. Or other Bayesian methods may be appropriate. However, the number of experiments you do must still be accounted for statistically. I do note that additional follow-up tests for key hits (serotonin/NFκB) mitigates these flaws somewhat, but that doesn't justify t-test mis-use. […] I do appreciate that how to statistically handle this kind of data in some sense is still up for debate. However, as this paper will be laying the foundation for future true high-throughput screening in the zebrafish, establishing rigorous standards for follow-up validation is of significant importance. May I recommend a nice discussion of these issues in Colquhoun D. (2014) An investigation of the false discovery rate and the misinterpretation of p-values. R. Soc. Open sci. 1: 140216. http://dx.doi.org/10.1098/rsos.140216 as a starting point for thinking through these issues? Thank you for choosing to send your work entitled “Quantitative in vivo high-throughput screen: repurposing drugs for increased β-cell mass” for consideration at eLife. Your full submission has been evaluated by Fiona Watt (Senior editor), Tanya Whitfield (Reviewing Editor), and three peer reviewers. The decision was reached after discussions between the reviewers. Based on our discussions and the individual reviews below, we regret to inform you that your work will not be considered further for publication in eLife. As you will see, while the reviewers found the work potentially interesting, all three have substantial and overlapping concerns with the manuscript, including the design, analysis and interpretation of the study, and the advances that it makes over existing work. 1) Using a ratio of β/δ cells: It is unclear to me precisely what practical function the δ cells serve in the initial screen. I realize the goal was to find things that specifically worked only in β cells, but wouldn't a compound that simply kept β cell intensity constant, yet decreased δ cell intensity, also show up in the screen? Where is this data used, as the biological differences here could be potentially important? 2) The assay they are using for induced β-cell differentiation: Nowhere do the authors show a photo of validation using the original transgenics used in the screen. Only in Figures 3 and 4, using the neuroD reporter, do they show validation. neuroD marks many cell types in this region, and the representative fish they show in Figures 3 and 4 show many, many ectopic GFP+ cells outside of the dashed line presumably marking the pancreas. Without the data from the original, how do we know that these drugs do not simply increase insulin-YFP expression in multiple areas of the embryo, which would have scored as a “hit” in the screen? Furthermore, and in line with this concern, how do they know that counting the neuroD positive cells outside of the dotted area does not simply represent abnormal migration/morphology of the endocrine progenitors? For instance, in Figure 3A, it really looks like the large GFP islet is diffuse in the parthenolide treated animal, so it is hard to know if this result truly represents enhanced differentiation or simply a migratory effect. 3) The signal/noise ratio calculation: This is very difficult to interpret in its current form. In Figure 1C/D, what exactly do the black/yellow (or red/yellow) bars indicate? And why is there seemingly no dose response relationship? 4) Positive controls: It is odd that in their initial screen, they used the notch inhibitor DAPT (notoriously insoluble) and this seemed to show a specific effect on β cells. Yet, in Figure 5, they use a different notch inhibitor (RO4929097) which now shows essentially no specific effect on β cells but instead an effect on both β and δ cells. This discrepancy makes it hard to know how to interpret the original screen. In fact, if anything, in Figure 5H, it looks like RO4929097 causes a decrease in the number of GFP+ cells. 5) Baseline stability of the reporters: In the discussion of 5HT section ('Serotonin signaling selectively increases β-cell proliferation’), the DMSO animals had 29 β cells, which went up to 35 β cells with RO4929097 (the positive control). Yet, in the next paragraph, and shown in Figure 6, the DMSO animals now show that the DMSO animals have 33 β cells, nearly the same number seen in their “positive control”. Granted, this further increases with fluoxetine to 42, but these inconsistencies when looking for relatively modest effects is of great concern, if the baseline stability of the assay (i.e. DMSO from experiment to experiment) is not especially stable. 6) The NF-κB reporter: In Figure 4, the authors show a dual color confocal of an NFκB/Notch reporter line, but yet oddly do not show the effect when they add in their hit compounds. While it is interesting that there are a few cells that co-label, this figure does not help us understand how these compounds may be affecting this signaling pathway in the fish. The manuscript by Wang et al., “Quantitative in vivo high-throughput screen: repurposing drugs for increased β-cell mass”, describes an ARQiv-based quantitative HTS screen in zebrafish for identification of drugs that increase β-cell mass. The screen identified drugs that enhance β-cell neogenesis and drugs that promote β-cell replication. Of those the role of NF-κB and serotonergic signaling were validated with additional experiments. Overall, the study is interesting because 1) it is the first true HTS screen performed in a vertebrate organism; and 2) it identified new regulators of β-cell mass. However, there are several issues with regard to the experimental approaches and the interpretations of the results. 1) Although the whole organism screen is powerful for identifying compounds [that increase β-cell mass, the hits may act direct to increase β-cell mass or indirectly by impairing insulin signaling or glucose metabolism, which in turn induces increase of β-cell mass. The latter may be problematic for therapeutic purposes. The long (from 3dpf to 7dpf) drug treatment in the screening protocol makes it difficult to distinguish the 2 possibilities. This should be addressed in the validation step. For example, do the selected hits increase glucose in the fish? Assuming the new β-cells are functional, do treated animals have a larger capacity to maintain glucose homeostasis under diabetogenic conditions? 2) The conclusions on β-cell replication are based on prolonged EdU labeling. The labeling protocol cannot distinguish whether EdU is incorporated prior to or after β-cell differentiation. This is especially the case for the adult studies where a two-week labeling period was used. 3) The evidence for the conclusion that NF-κB signaling in pancreatic progenitor cells regulate endocrine differentiation needs to be strengthened. For example, it is not shown whether the inhibitors decrease EGFP expression in the ductal progenitor cells. 4) The conclusion that neurotransmitter modulators act through the neuronal signaling pathway is too simplistic. The pancreatic β-cells have many neuronal characteristics, including the ability to synthesize and perceive many neurotransmitters. These modulators may act directly on β-cells. Wang et al. describes a high throughput screen in zebrafish for small molecules that can affect pancreatic β-cell proliferation. Given that similar screens have been previously described (Tsuji et al. 2014), including by this group (Rovira et al. 2011), the main advance described here is the high automation of the screening assay, with a secondary novel finding being the link between β-cell production and NF-κB signaling. Unfortunately, I found the description of the screening, especially all the computations, statistical calls, and subsequent validations, to be so sloppily described that it is difficult to understand what was actually done. The work does not appear to have been carefully edited, with major editing errors appearing as early as the Introduction – the sentence starting with “OR-4” appears to be an editing note – and this permeates throughout the figures and the text. My impression is that there is not much of an advance over the other zebrafish pancreas screens. It is also unfortunate that none of their hits appear even close to as effective as their positive control, DAPT (e.g. Figure 3C, where DAPT is off the charts and most of the 'hits' look like modest effects at best). First, they lay out some details of the positive control, DAPT, in Figure 1, but there the mysteries already begin. Figure 1C and D show some box plots, with color-coding that I do not understand, with a curve fit to the data in some way that is not described, and a reference to a “blue-lined range” that doesn't exist. Somehow this data is used to evaluate hits later, but I already don't understand it, and this is not described in the very superficial Methods section, either. Figure 2A-D shows a glimpse of the computational logic, but none of this is explained. There is some kind of curve fitting, never once mentioned in the text or Methods, Figure 2B shows something called a “Ranked Avgs”, also never described, and Figure 2C shows a map of SSMD values, but how this is calculated, and how the 1.3 cutoff was chosen, is never said. All this detail is important, but I cannot find it anywhere, in the Methods, or supplement or figure legends. In the next step, they validate their hits, but I still have concerns. First, none get even close to the effect of the positive control. Second, the Methods say this was evaluated by Student's t-test, but surely this needs to be corrected for multiple comparisons. Third, I am unclear about how a secondary islet is counted, as the arrows shown in Figure3–figure supplement 1 seems to point to more like 6-10 islets, but Figure 3C never gets above 6 islets. Are these best cases only? Are some islets more dispersed, so not counted the same? I can't tell. Finally, they implicate two signaling pathways, NF-κB and serotonin, in β-cell proliferation. The serotonin pathway is already well described, so the novelty of these results rest on the NF-κB story. Unfortunately, this is not terribly convincing-the compounds from the initial screen, thioctic acid and parthenolide, are not exactly NF-κB go-to compounds, and the other compounds they test in Figure 4C are barely described and should be shown as a dose-response, not a single, mysterious dose. Whether these compounds affect NF-κB signaling in zebrafish in these conditions is also unknown, but they could have tested this directly with their NF-κB reporter fish. Importantly, the reviewer’s new comments also helped us to reevaluate changes we had made in the revision that mistakenly linked effects on progenitor cell proliferation with Lead II compounds – those showing no effects on differentiation in any of the assays we performed. In the absence of induction of precocious differentiation, any compound promoting progenitor cell proliferation would result simply in more progenitors, not more β cells. We therefore reasoned that increased β cells, in the absence of effects on differentiation, are due to increased proliferation of existing β cells. For instance, paroxetine induced more fluorescent signal in the primary assay yet in all subsequent follow up studies did not induce differentiation of pancreatic progenitors. This we showed by lack of precocious secondary islets in larvae treated with this drug. Therefore, one likely explanation for increased fluorescent signal is simply more β cells in the pre-existing principal islet. This we showed to be the case by counting β cells in the principal islet .Since we had shown that no differentiation is induced by serotonin, any effect on progenitor proliferation would have no effect on β-cell numbers. Instead, additional progenitors would remain as progenitors. More progenitors can only produce more β-cells if precocious differentiation was also induced. Indeed, as discussed above, since differentiation and proliferation are often coupled, compounds inducing proliferation in progenitors are likely to cause precocious secondary islet formation and be classified as Lead I compounds. Increased proliferation of pre-existing β cells would account for increased β-cell mass in the absence of differentiation. In the example of paroxetine, we succeeded in showing increased cell-division in pre-existing β-cells – demonstrating proliferation is indeed affected. This is the same result obtained by Tsuji et al. (2015) using FUCCI fish to test the effects of serotonergic signaling on β-cell proliferation directly. The reviewer has made reference to an apparent discrepancy regarding this data in Figure 6. In Figure 6B, we show data for increased β-cell numbers after paroxetine treatment. On average, 7 additional cells are seen per principal islet. By EdU pulse-fix, on average of 9 cells are labeled (versus an average of 3 in the control). This data would be confusing if labeled cells divide only once as 9 EdU+ cells should have only lead to an increase of 4.5 cells. However, if some cells divide twice many possibilities can occur (e.g. 3 cells dividing twice gives 9 labeled cells and an increase of 6). In addition, some new β cells could have arisen from β cells that had already traversed S-phase. Finally, as this was a pulse-fix assay, some of the labeled cells are likely post-S but pre-M phase. Clearly, these possibilities make it difficult to simply add the number of EdU labeled cells and divide by two, let alone to use that approach to determine which types of cell are dividing. In summary, we are confident that our interpretation of the data is consistent with the results we observed and have made the following changes to ensure the text is in keeping with our position (note, this includes omission of prior changes which we made in error that linked progenitor cell proliferation to ‘validation’ assays for Lead II compounds – i.e., since, effects on progenitor cell proliferation were never assessed it is inappropriate to state that such an effect was validated). 1) Abstract: Further, we discovered novel roles for NF-κB signaling in regulating endocrine differentiation and for serotonergic signaling in selectively stimulating β-cell proliferation. 2) Introduction: By labeling β cells with a fluorescent protein and quantifying changes in fluorescence after exposure to JHDL compounds, many more drugs were identified that induced endocrine differentiation and/or stimulated proliferation of β cells. 3) Introduction: Secondary confirmation screens were designed to determine whether potential hit drugs induced endocrine differentiation (precocious secondary islet formation) or stimulated β cell proliferation (increased β-cell numbers in the absence of effects on differentiation). 4) Subsection “Primary Screen: ARQiv Assay”: The majority of the 46 Hit I and Hit II compounds underwent a series of ’validation assays’ to confirm effects on endocrine differentiation and/or β-cell proliferation. 5) Subsection: Serotonergic signaling stimulates β-cell proliferation. 6) Subsection “Serotonergic signaling stimulates β-cell proliferation”: Combined with our data suggesting paroxetine acts directly on β cells (Figure 4B-F), these results strongly suggest that enhanced serotonergic signaling promotes proliferation of β cells. 7) Discussion: Accordingly, quantification of β cells within the principal islet was used to confirm 15 of 30 Hit II compounds as Lead II drugs for stimulating proliferation of β cells (Figure 4A). 8) Figure 4, legend: Validation of increased β cell proliferation: cell counts. 9) Figure 6, legend: More β cells overall, and more EdU+ 1020 β cells, are observed with 1μM paroxetine and 5 μM RO4929097 treatments, suggesting effects on β-cell proliferation. C) Plot of EdU+ 1021 β cells as a percentage all β cells shows that paroxetine treatment stimulates β-cell 1022 proliferation, whereas Notch inhibition does not. NeuroD in the pancreas is a marker of endocrine progenitors in numerous model species, including zebrafish. 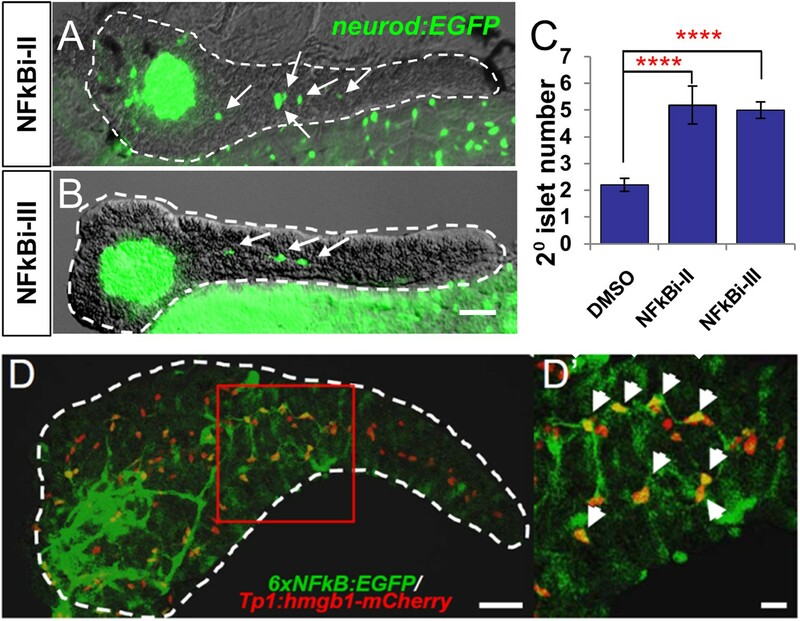 In addition, the neuroD:GFP line utilized has been used previously in several studies to mark endocrine progenitors (including our previous work, Wang et al., 2011; and that of other groups, Kimmel et al., 2011; Dalgin et al., 2011 & 2015; Matsuda et al., 2013). NeuroD also labels enteroendocrine cells of the gut, and progenitors elsewhere in GI tract, thus the expression outside the pancreas is normal. Depending on section of the image and rotation of the gut, more or less neuroD cells can be seen. The fact that neuroD is normally expressed in cells other than those in the pancreas is one reason we didn’t try using these fish in the initial screen. The 5HT antibody we used, a rabbit polyclonal from ImmunoStar (#20080), was previously validated in zebrafish by Pietsch et al., 2006, Uyttebroek et al., 2010 & 2013, Won et al., 2012, and Simonson et al., 2013. As serotonin is conserved across species, the same antibody has been used to label the serotonergic system in numerous other species, including mouse, rat, butterfly, zebra finch, crayfish, snail, and even scorpion! Our anti-5HT labeling shows expression in pancreatic islets (dashed circles) and along serotonergic nerve innervating the pancreas (indicated by the overlap with a-tubulin staining to indicate neuronal processes, i.e., ’yellow’ areas in the merged image). 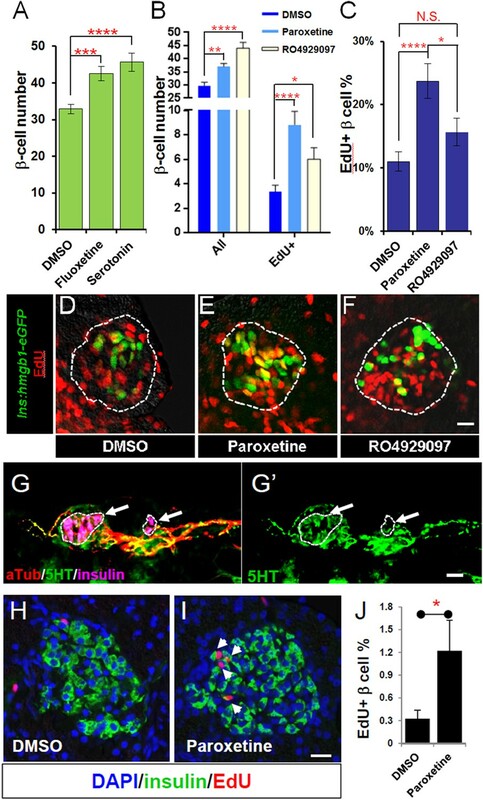 The majority of the areas that do not overlap with insulin outside the pancreas are therefore neuronal processes of a serotonergic nerve(s), in keeping with other studies in zebrafish showing labeling of serotonergic nerves in the enteric system (Uyttebroek et al., 2010; Simonson et al., 2013), and that this antibody labels neuronal tracts (Won et al., 2012; Uyttebroek et al., 2013). We provide an additional figure showing each channel separately which may help to delineate the neural component (Author response image 1). I do note that additional follow-up tests for key hits (serotonin/NFκB) mitigates these flaws somewhat, but that doesn't justify t-test mis-use. […] I do appreciate that how to statistically handle this kind of data in some sense is still up for debate. However, as this paper will be laying the foundation for future true high-throughput screening in the zebrafish, establishing rigorous standards for follow-up validation is of significant importance. May I recommend a nice discussion of these issues in Colquhoun D. (2014) An investigation of the false discovery rate and the misinterpretation of p-values. R. Soc. Open sci. 1: 140216. http://dx.doi.org/10.1098/rsos.140216 as a starting point for thinking through these issues? We thank the reviewer for correcting our mistake. We have reanalyzed all of the figures comparing more than a single group back to the control using a post-hoc correction for multiple comparisons, namely Dunnett’s test, to derive p-values. All corresponding figures, figure legends, tables, and methods have been updated accordingly. We are happy to report that although this resulted in slight alterations in the reported p-values, all compounds deemed to have achieved statistical significance in the initial report remain so after performing the Dunnett’s test correction for multiple comparisons (see edits in Tables 1 and 2 regarding changes in rank order). The β/δ ratio was not used to define hit compounds. Hits were defined solely based on the YFP SSMD scores calculated by comparing compound-induced YFP signal to vehicle control YFP signal. Thus, the scenario described, where δ -cell numbers decrease but β-cell numbers remain as per controls, would not have been flagged as a hit because the YFP SSMD score would be <1.3, thus below the ’hit‘ selection cut-off. Conversely, the δ -cell SSMD score would likely have been in the negative range. Such a compound would have been dismissed as a non-hit. As the reviewer describes, the β/δ ratio enabled detection of compounds that preferentially altered β cell numbers (i.e., increased YFP signal relative to vehicle control) without altering δ cells (i.e., no increase in RFP signal relative to vehicle control) – thus potentially acting specifically on β cells. However, again, this was not the metric used to define hits. We agree with the reviewer concerning the potential importance of compounds having differential ’biological effects‘ on β and δ cells. Indeed, this is highlighted in our study in terms of the novelty of our findings regarding serotonergic signaling. We thank the reviewer for pointing out this confusion and have made the following changes to the text. Modifications: We have rewritten the text to clarify how relative levels of β and δ cell reporters were applied. We have reinforced that ’Hit Calls‘ were based solely on YFP (β cell) SSMD scores and that SSMD scores were calculated independently for each fluorophore relative to the negative control (0.1% DMSO treated fish). We also re-evaluated the methods used to determine DAPT (positive control) performance and found an error: the use of non-transgenic fish as background rather than DMSO treated transgenic controls. We have corrected the text and corresponding figures which now show the proper DAPT / DMSO signal level rather than S:B (Figure 1E). This correction shows that RFP signal detection is approximately four-fold less robust than YFP, due to elevated autofluorescent background in the RFP emission range. In turn, this resulted in a de-emphasis of the YFP/RFP ratio in the updated manuscript which will help to clarify how hit plates were identified. A) Validation in original transgenics: We have added an additional micrograph showing the effects a representative hit compound on secondary islet formation in the β/δ transgenic line used for the primary screen (Figure 2–figure supplement 1). We have also modified the text to clarify the logic behind pursuing ’precocious‘ 2° islet assays to validate compound effects on endocrine differentiation. Specifically, we emphasize more strongly that detection of endocrine differentiation effects during initial visualize assessments of ’hit call plates‘ at day 7 – thus using the original β/δ transgenic line – was not overly robust (only observed in subsets of treated fish in hit call plates). This is likely because insulin and sst2 expression are only beginning to emerge within 2° islets at ∼day 8, as these promoters mark fully differentiated cell types. Thus, termination of the primary screen at day 7, to some degree, limited our ability to detect endocrine differentiation effects. Finally, we note that the use of alternative (e.g., ’orthogonal‘) assays for secondary confirmation is a common, if not preferred, practice in HTS drug discovery. Therefore, the strategies we have used for hit validation are in keeping with accepted practices. B) NeuroD is normally expressed in many areas outside of the pancreas, but GFP+ cells outside the pancreas were not included in the analysis of secondary islet formation. The dissected pancreas is quite easily delineated (dashed lines, Figure 3 and Figure 3–figure supplements 1 and 2). Regarding the question of abnormal migration/morphology of endocrine progenitors, again neuroD:GFP+ cells outside the pancreas were not counted. Migration from the gut into the pancreas is extremely unlikely and has never been described in any developmental model system analyzed. C) Drugs increase insulin-YFP in multiple areas: all potential hit call plates were visually evaluated immediately after the ARQiv scan using standard fluorescence microscopy. Plates showing ’yellow‘ fluorescence in other than the pancreatic region were eliminated from further analysis, as shown in Figure 2D in updated manuscript (2E in the original manuscript); 29 ’fluorescent compounds‘ referred to autofluorescent and/or compounds suspected of ’staining‘ larval fish. We revised the manuscript to emphasize this point. We saw no expression patterns suggestive of ectopic insulin expression. However, compounds that significantly increased insulin expression levels in general should have been flagged as hits, as the reviewer notes. A priori, we do not know if any hit drugs had this effect. We tested for effects on endocrine differentiation and β cell proliferation. We noted in the discussion the possibility that hit calls that failed to be validated as leads for differentiation or proliferation assays may have direct effects on the insulin promoter. Finally, regarding possible migratory effects as judged by the ’diffuse‘ appearance of the principal islet in the parthenolide treated micrograph. Principal islet morphology is variable. More importantly, all hit call compounds being were flagged due to evidence of increased β cell-associated signal (>YFP). A migratory effect on endocrine progenitors, without increased differentiation, would not be predicted to produce that effect. Combined with the fact that ten other compounds showed similar expression of neuroD and pax6b reporters within the tail of the pancreas, we feel the most parsimonious interpretation is increased numbers of secondary islets – consistent with prior studies (Wang, Y. et al. 2011, Development, Parsons, M et al. 2009, MOD, Ninov, N et al. 2012, Development). We apologize for the confusion and we have now modified the figure in question. In its new form, we hope figure 1E addresses the reviewer‘s concerns. We more clearly label the y-axis as the ratio of DAPT-treated to DMSO-treated signal, and provide an inset legend showing that yellow lines denote YFP-expressing β cells and red lines denote RFP-expressing δ cells. We also present the data as a standard dose-response curve to avoid confusion. We failed to adequately address this point in the first version of the manuscript. There is no discrepancy between the results gained from either DAPT or RO4929097. The Notch inhibitor DAPT does not show β cell specific effects and has a well-documented effect on all endocrine cells. The original Figure 1C-D showed equivalent effects β and δ cells. To avoid confusion, we modified this figure (now Figure 1E) as discussed above to better show dose-responsiveness. DAPT was chosen for the primary screen as it was readily available at significantly lower cost than RO4929097. Moreover, DAPT was the only published compound shown to have effects on endocrine differentiation in larval zebrafish at the time the screen was initiated. In subsequent validation screens we took advantage of the newer compound as it is a more soluble compound. For the validation screens we didn‘t need to use as much compound so price was not so much of an issue. However, both compounds have similar effects in the assays we performed, we now state this explicitly in the text to clarify. In a new Figure 4 we show a 3D render to show the increase in β-cell mass caused by paroxetine and RO4929097. The previous Figure 5 had been compiled with single z-plane optical sections – admittedly not the best way to allow easy quantification for the reader. We now include an inset of a single z-plane to make it clear there is no co-localization. We have extensive experience with this issue, and have found this level of variability to be quite normal when comparing between different strains of fish or across biological repeats. In our work, the average numbers of β cells observed within the principal islet can differ as much as 3-5 cells across strains or per repeat. For this reason, every experiment is properly (internally) controlled and standardized to a DMSO control. We have added additional data to show that all the NF-κB inhibitors used in this study dramatically reduce fluorescent readout from the NF-κB reporter (Figure 5–figure supplement 1). We feel it is important to establish which cells are undergoing active NF-κB signaling. Using two transgenic reporters, we show NF-κB signaling is in fact occurring in the progenitors (Figure 5) – this observation fits perfectly with NF-κB inhibition causing precocious endocrine differentiation in a cell-autonomous way. The reviewer has brought up a very salient point; namely, that any compound leading to a rise in glucose levels would be expected to cause a reciprocal increase in β-cell number. To address this potential mechanism, effects of lead compounds on glucose levels were investigated and the results included in the revised manuscript (Figure 6–figure supplement 1). Only one of the lead compounds, amcinonide, increased glucose levels. This is to be expected for a glucocorticoid. No other characterized lead compound had significant effects on glucose. We thank the reviewer for this suggestion and feel that the new data add significantly to this work. We thank the reviewer for correcting this interpretation of the data. We have revised the manuscript to denote this limitation. Nevertheless, stimulating proliferation of β cells or their progenitors is equally of interest to the field. Data regarding compound effects on the NF-κB reporter line are now included in the revised manuscript (Figure 5–figure supplement 1). The results are consistent with the tested NF-κB inhibitors reducing the expression of the NF-κB reporter in the progenitors which then subsequently differentiate. We agree with the reviewer and have made corresponding changes to the manuscript. We have revised the text to denote this limitation, eliminating discussion of neuronal signaling as the sole source of neurotransmitters. We apologize for the typos and grammatical errors and have carefully revised the manuscript as these issues clearly detracted from the work. We feel the revised manuscript will be of great interest to many researchers as it establishes methods that can be used for multiple whole-organism screening applications. Moreover, the manner of high-throughput screening described here reaches a capacity not seen before for whole-organism assays. The methods described will allow researchers to utilize existing transgenic lines to find new molecular pathways in their areas of interest. Furthermore, compared to previous high-content screens, ARQiv is more cost efficient – a vital attribute these days. Finally, there are a lot of important statistical matters that do need to be addressed and described to account for signal variability that attends in vivo screening whether in cell culture or model organisms. To do so fully in one paper is difficult. To these ends we have expanded the Methods section in the revised manuscript and put additional details in a methodological JoVE article that will be published as a companion to this work. It is true, and well noted, that Notch-inhibition is the strongest way to induce endocrine differentiation. Clearly, this is because the progenitors use Notch-signaling to remain undifferentiated. This observation has been made by many people in different organisms and multiple different tissue systems. Notch-inhibition, therefore, would make an unlikely therapeutic agent as the effects would be widespread and detrimental. This has been discussed and published several times elsewhere by us and others. Thus, we were actually encouraged to see compounds having partial effects as compared to Notch inhibition. We were in fact trying to identify compounds that modulated other, hopefully more discrete, pathways that act parallel to, or in concordance with, Notch. We have emphasized this in the Discussion of the revised manuscript. We agree with these comments and have made substantial changes. Figure 1 has been changed and simplified. It includes a new graph with the DAPT dose-response plotted and includes details of the curve fir function. As noted for reviewer #1, the comments also spurred us to review the methods for the plot, revealing an error with regard to the proper negative control which has been corrected (see above for details). The updated figure more clearly demonstrates the utility of DAPT as a positive control. In the updated Results and Methods we now discuss in greater detail what SSMD scores are and how they are calculated to flag potential hit compounds. We also discuss how computational bootstrapping of DAPT and DMSO control datasets was used to estimate a hit cutoff of SSMD ≥1.3. At this score, we predict compounds are causing a change in fluorescence equivalent or greater than half the effect caused by the Notch-inhibitor DAPT. We no longer show the ranked averages of the multiple comparisons data, as further review of that MATLAB function found the corresponding plot to be enigmatic, as the reviewer pointed out. All the curves in the figures were drawn using either best fit (solid lines) or a single polynomial curve fit function (dashed lines). This information is now included in the expanded Methods. 1) Notch-inhibition is indeed the strongest way to induce endocrine differentiation. However, this effect is not clinically relevant as the Notch pathway is essential for the function of multiple organs. Thus, we were not trying to recapitulate the effects seen with Notch-inhibition. Rather, we were looking for alternative mechanisms for increasing β-cell mass without shutting down an essential signaling pathway, either via endocrine induction or stimulation of β-cell proliferation. 2) In each validation experiment we are comparing the average result produced by one condition (i.e. control) to another condition (i.e. drug). We are only ever comparing a single attribute between conditions (e.g., the number of secondary islets), not comparing different attributes across conditions. If the latter were the case, a multiple comparisons test would be warranted to eliminate the possibility that differences between conditions arose due solely to chance, in particular as the number of attributes compared increases. However, this is not the case for any of our validation tests. For this reason, we believe the Student‘s t-test to be appropriate. 3) Indeed some of the examples shown were best cases. We are grateful for the reviewer pointing this out. All images are now examples that better reflect the average result. It is true that Serotonin signaling has been shown to be essential for β-cell mass increase seen during murine pregnancy. Serotonin has also been implicated in insulin secretion in cells in vitro. In addition, Tsuji et al., recently performed a manual chemical screen in early fish larvae (72-96 hpf) suggesting serotonin signaling can stimulate β-cell proliferation. However, this was not the emphasis of their manuscript; only a single potential hit compound, trazodone, was validated with no further experimentation regarding the role of serotonin. In addition, whereas Tsuji et al., identified only three neuromodulators, this is the largest class of potential hits in our study, implicating twenty-plus neuromodulators. More importantly, only in our work is data presented suggesting that serotonin may act in a cell-type selective manner; increasing proliferation of β cells, or their progenitors, without altering δ cell numbers. As such, we were motivated to thoroughly characterize this pathway and thus our study is a more comprehensive description of the effects of serotonergic signaling in the endocrine system. To further emphasize this point, in the updated manuscript we now go on to show that paroxetine significantly increases β-cell numbers in larval and adult fish, and neonatal mice. Our results therefore stand as novel and should be disseminated in a journal promoting widespread exposure. Furthermore, considering the number of people using paroxetine as a medication, it is of general importance that potential actions of this drug are highlighted. Regarding the lack of ’go-to‘ compounds. The JHDL contains drugs approved for use in humans which facilitates repurposing for new indications following new screens. However, much is known about potential mechanisms of action for compounds in such libraries and this information can be used to test the relevance of implicated signaling pathways. Accordingly, we noted that among our validated Lead I drugs, two were known to inhibit NF-κB signaling. Accordingly, we tested two other NF-κB inhibitors, which are well known and as mentioned in original text inhibit the NF-κB signaling at different levels of the pathway. For additional clarity we now mention in greater detail the mechanism of action for these additional compounds. All 4 compounds stimulated endocrine differentiation and as mentioned in text each compound targets a separate part of the NF-κB pathway. We believe this result is consistent with NF-κB signaling being involved in pancreatic progenitor maintenance. A dose-response was performed on all tested compounds, both for the primary screen and for validation assays. We have more strongly emphasized this point in the revised text. However, for clarity, we show results only from optimal concentrations as mock-ups of dose-responses for all compounds were less visually informative. We have listed optimal concentrations for all compounds in each assay. To address the reviewer‘s concern as to whether the NF-κB inhibitors do indeed inhibit NF-κB signaling in zebrafish, we have added additional material to Figure 5–figure supplement 1. In this figure the fluorescent signal from an NF-κB transgenic reporter line is diminished by all 4 NF-κB inhibitors used in this study. This is shown both by imaging of transgenic pancreata and quantitatively using ARQiv. We have revised the text appropriately to reflect the addition of this new data. JSM: Acts as a consultant for, Luminomics Inc., a company which uses drug discovery techniques applied in the text. We are grateful to Dr Meera Saxena and members of the Parsons and Mumm laboratories for critical reading of this manuscript. We thank John F Rawls for providing transgenic lines. The authors also wish to thank Dr Yue J Wang for providing the cover image. This work was supported by the NIDDK, NIH (1RC4DK090816). Other support was as follows: GW and MJP—Juvenile Diabetes Research Foundation (17-2012-408), and the NIH (R01DK080730); FD -MSCRF 2013 Postdoctoral Fellowship; SKR and JSM—Diabetic Complications Consortium, NIDDK, NIH (12GHSU209). JSS—Science and Technology Development Fund (FDCT) of Macau SAR (FDCT/119/2013/A3); RK—NINDS (R01 NS073751); JOL—FAMRI, ITCR and Prostate Cancer Foundation. The funders had no role in study design, data collection and interpretation, or the decision to submit the work for publication. Animal experimentation: This study was performed in strict accordance with the recommendations in the Guide for the Care and Use of Laboratory Animals of the National Institutes of Health. All of the animals were handled according to approved animal care and use committee (ACUC) protocols of Johns Hopkins University and Georgia Regents University. © 2015, Wang et al.